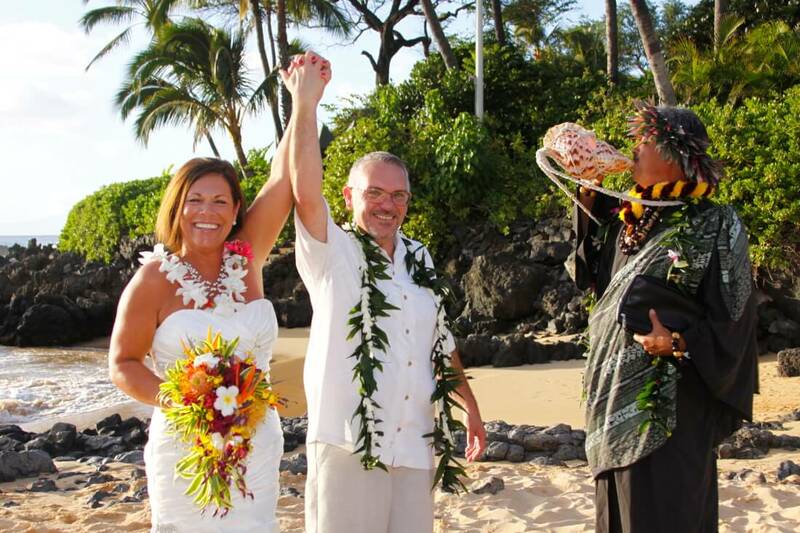 Enjoy this “Real Wedding” from start to finish. 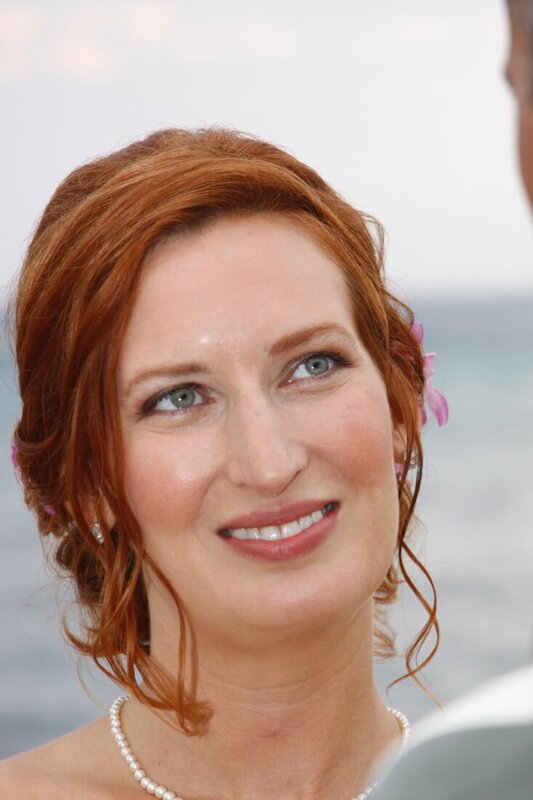 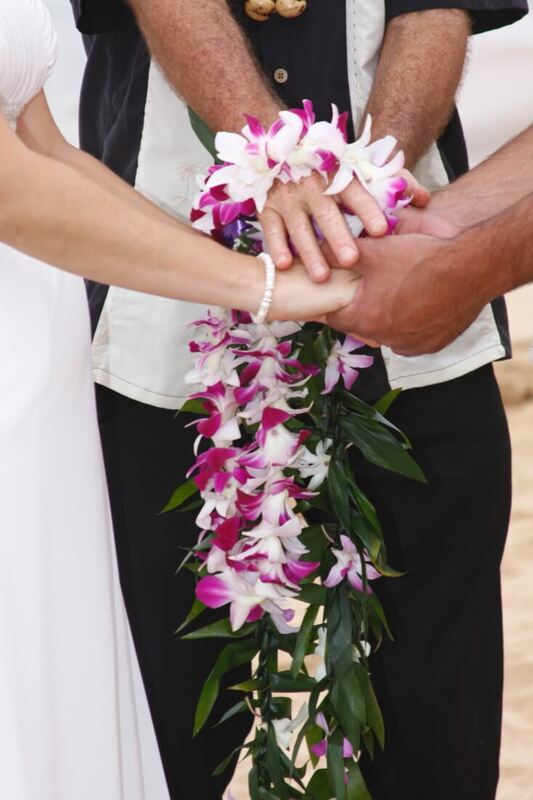 This is where Maui wedding planners can really assist you in your choice of Maui wedding private locations as well as assisting in hiring the best wedding vendors for you. 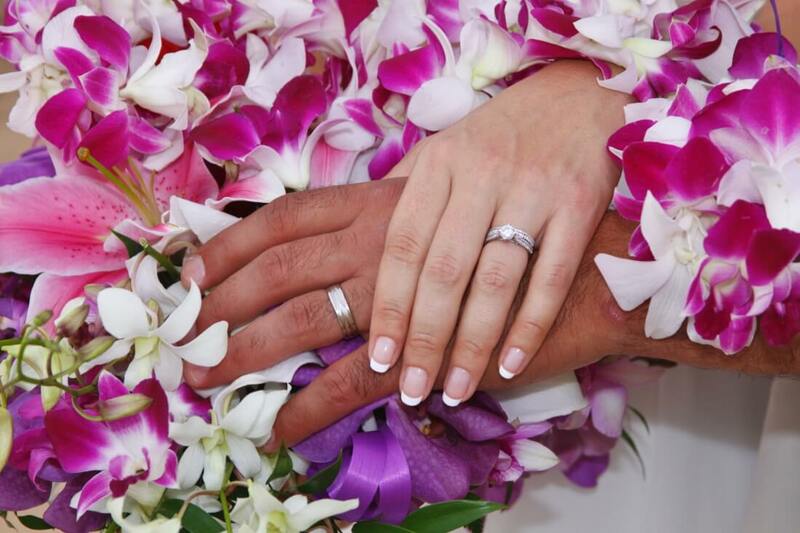 Maui wedding planners have been working in the industry and know who fits best with the couples that choose her company to plan the wedding details. 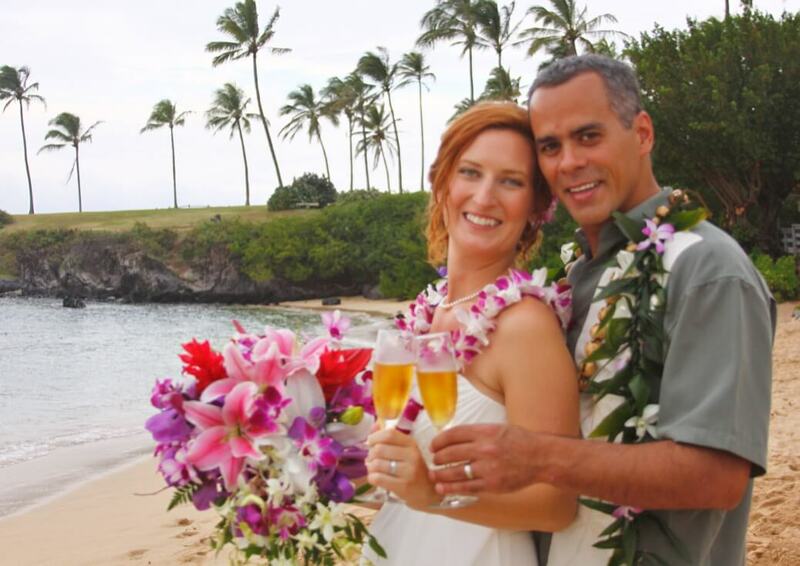 Sometimes a private location is best just because of the one thing; that most couples and their family want privacy. 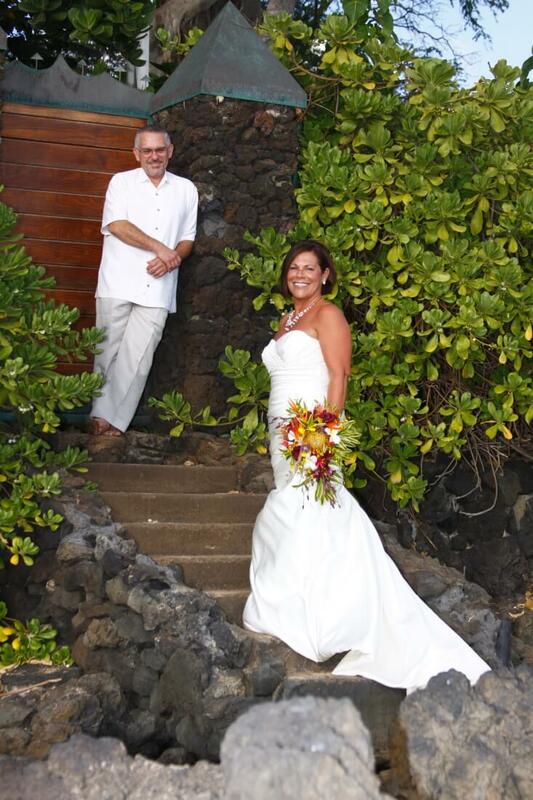 This wedding took place at a home the family rented and it was the perfect place for their families residence the week they were on Maui as well as gave them the big yard with the landscaped property and the spectacular view of the ocean below and the sunset colors that we all want to have on our Maui wedding day. 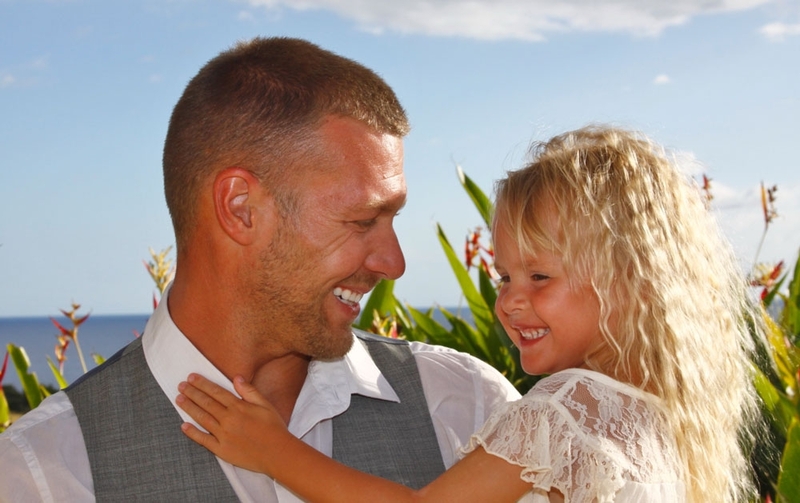 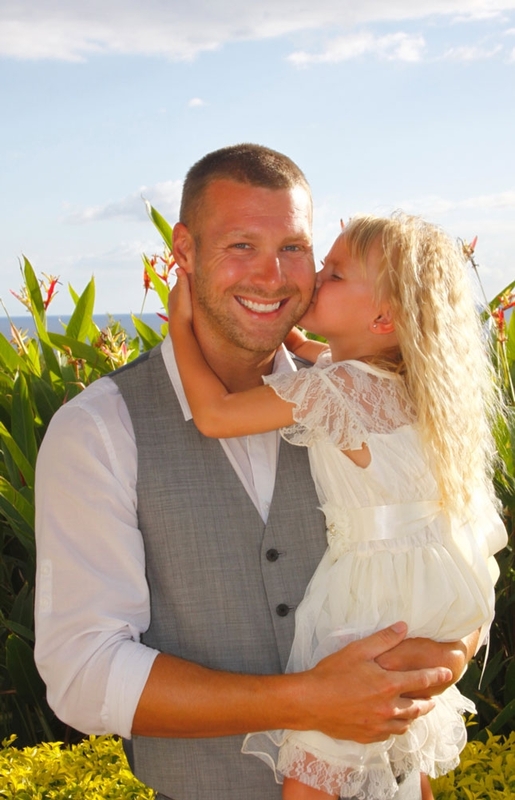 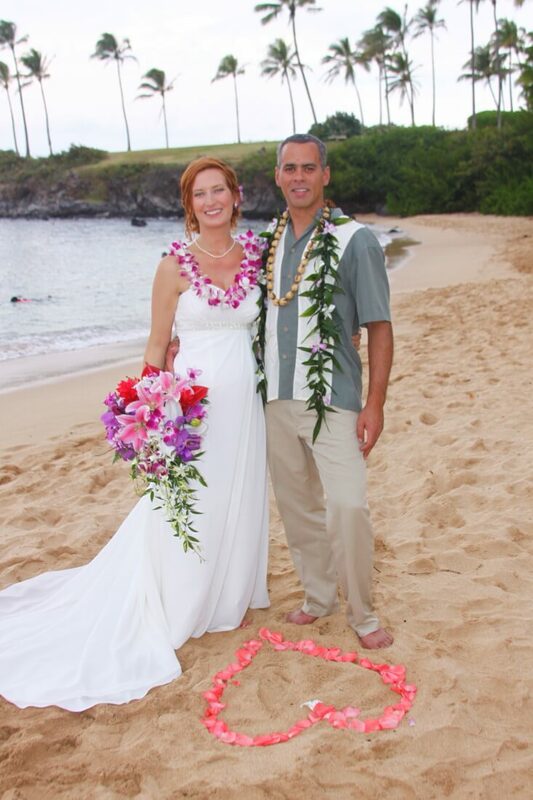 This was a summer wedding in Maui and the family wanted to have everything wonderful for their children’s wedding day. 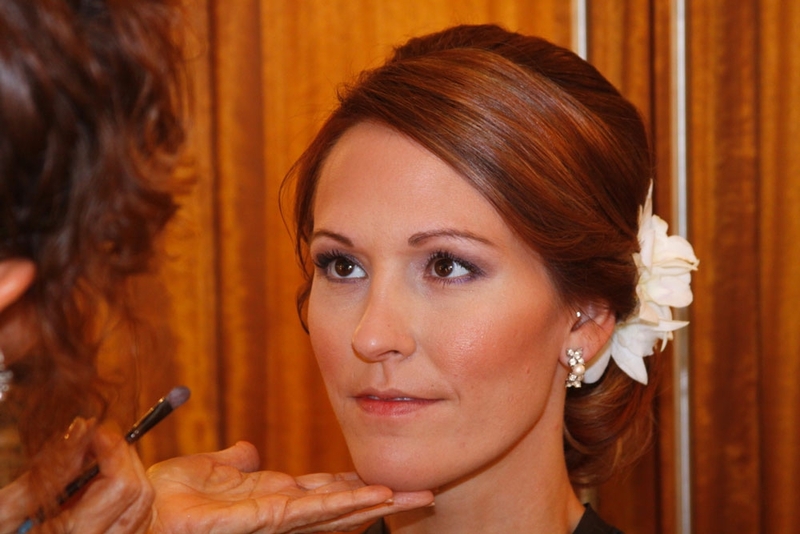 They worked with the planner to hire the hair & makeup artist to come early to get the bride ready with the look of a princess. 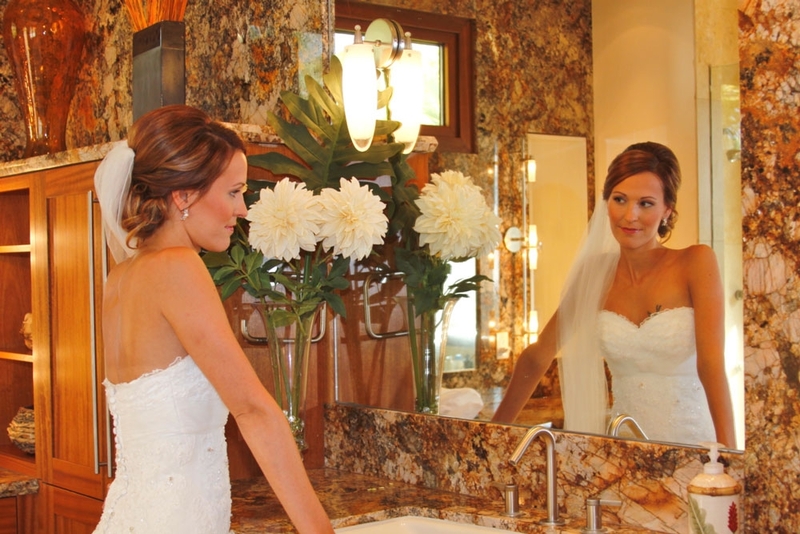 Also having the photographer there early to capture photos of the bride getting ready and those very cool mirror image shots adds to a full event of the days celebration. 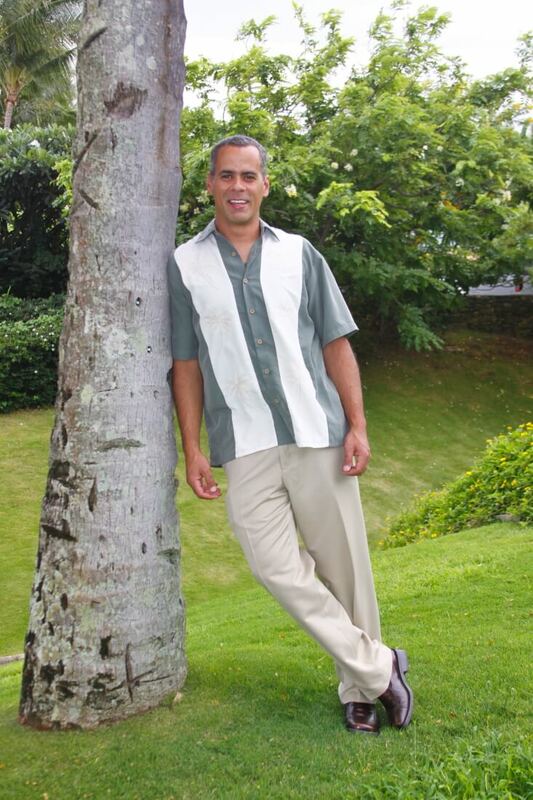 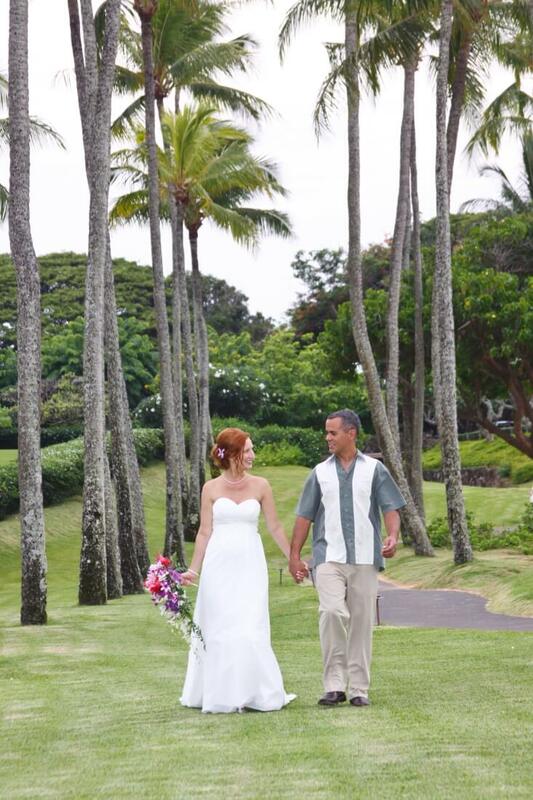 And lets not forget the Maui groom relaxing by the pool while awaiting his bride to be ready for their ceremony. 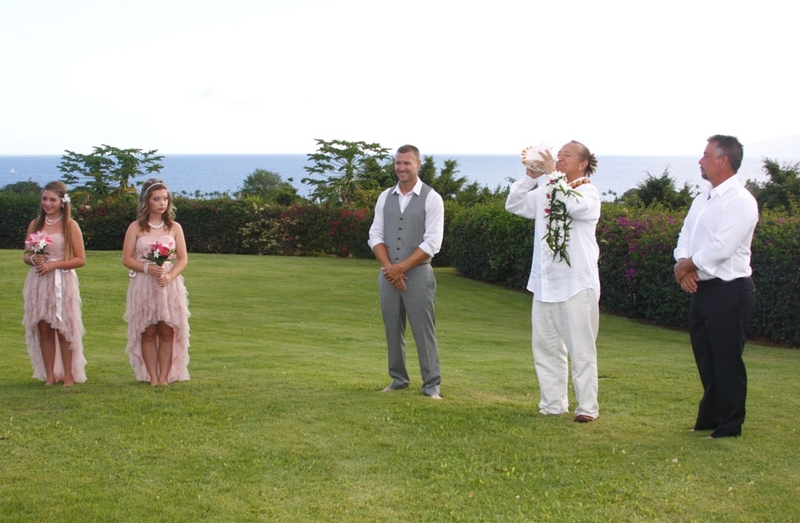 The ceremony begins with the family gathering on the hillside with the west Maui ocean as a back drop and the Hawaiian minister blows the conch shell, the musician starts to serenade the brides entrance on the arm of her father while the videographer and photographer capture all the moments they want to relive over & over again with family and friends. 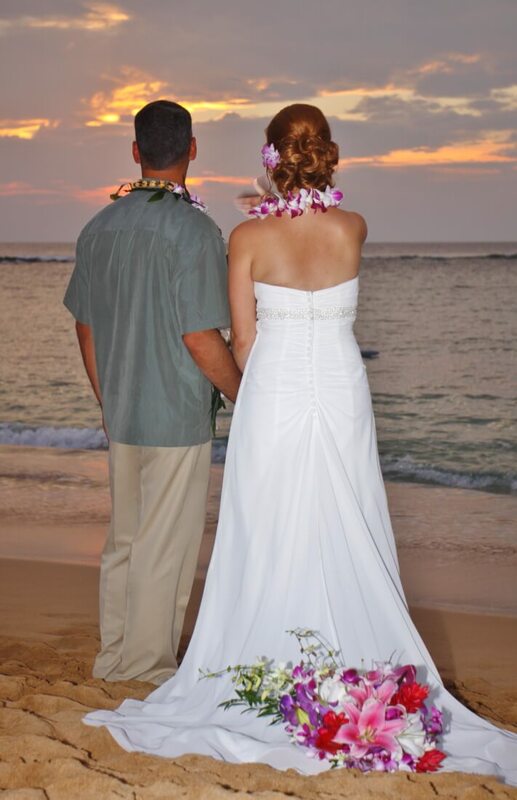 After the ceremony the portraits photos are taken along with some video segments including the celebration toast and cutting of the cake and then of course ending it all with those beautiful Hawaiian sunsets. 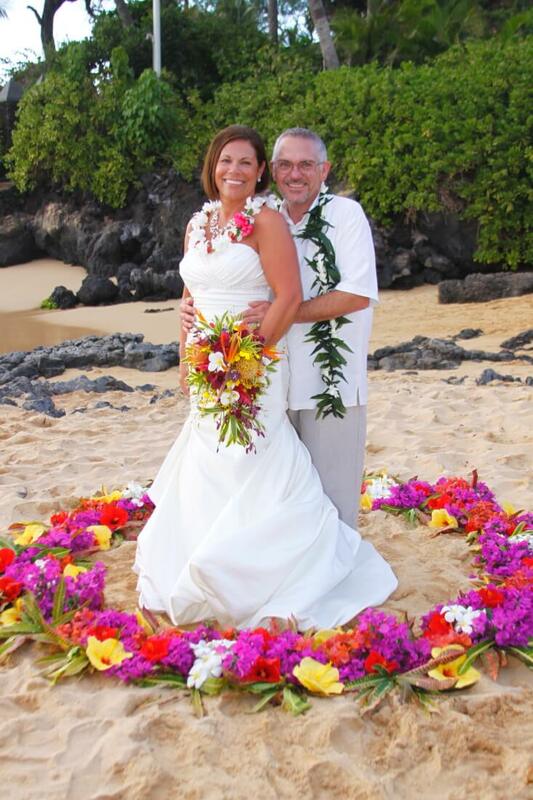 Your Maui wedding planners do their best to make the whole event the best Maui wedding day you could have dreamed of. 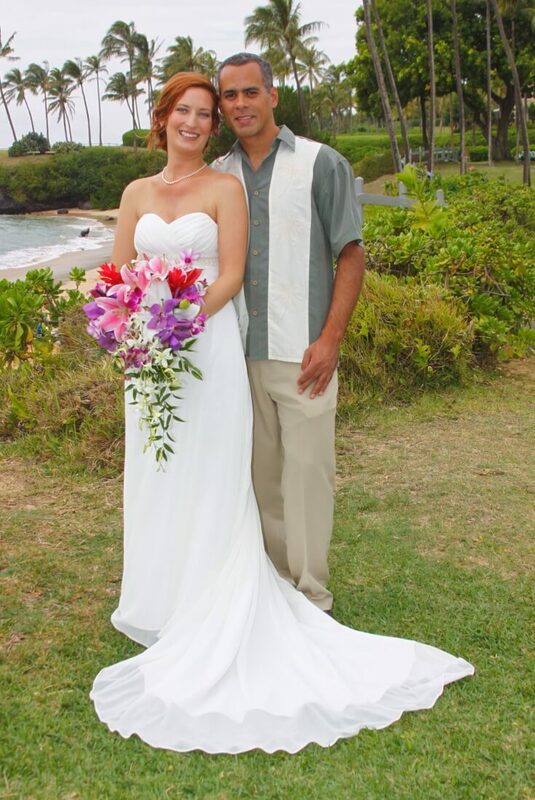 When choosing a time for their wedding, Maui wedding planners know that the bright blue colors are important to the couple, thats why we talked about a morning wedding at Kapalua Bay on Maui’s west side shore. 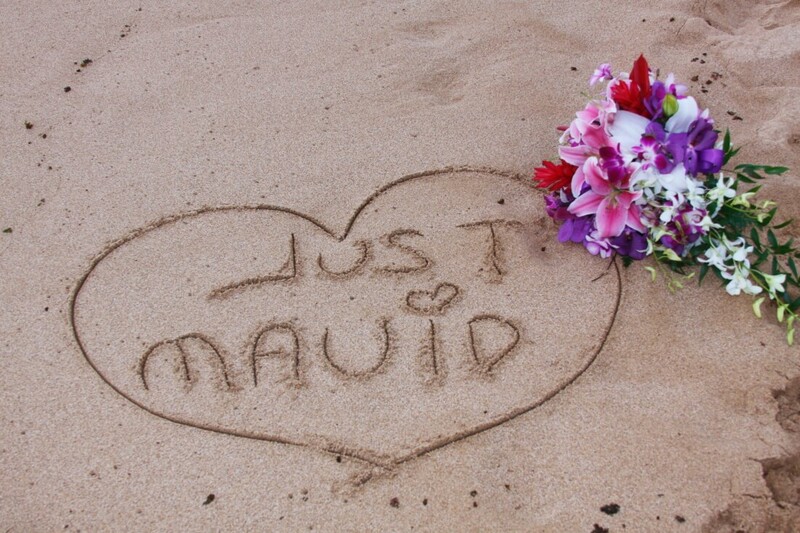 This bay is known for its clear calm water and protective serene feeling, and makes it the best choice for a morning wedding. 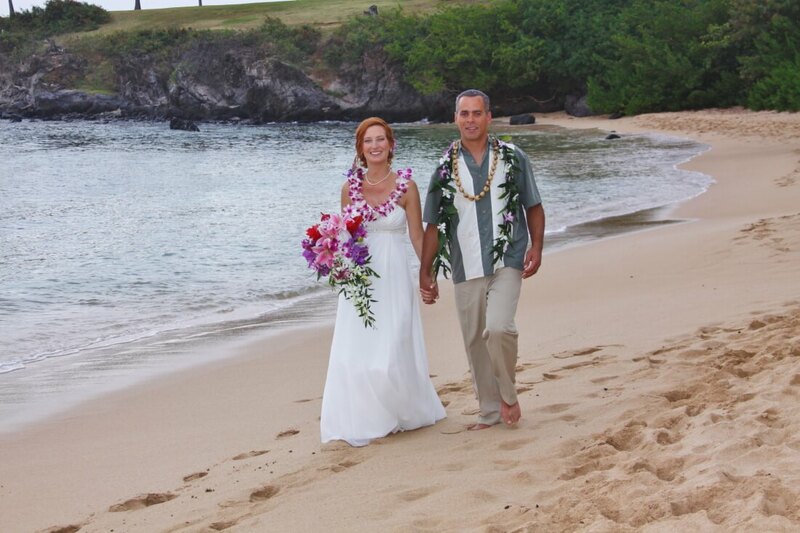 The lava rocks that cradle the bay give it its name, Kapalua (meaning ” arms embracing the sea”). 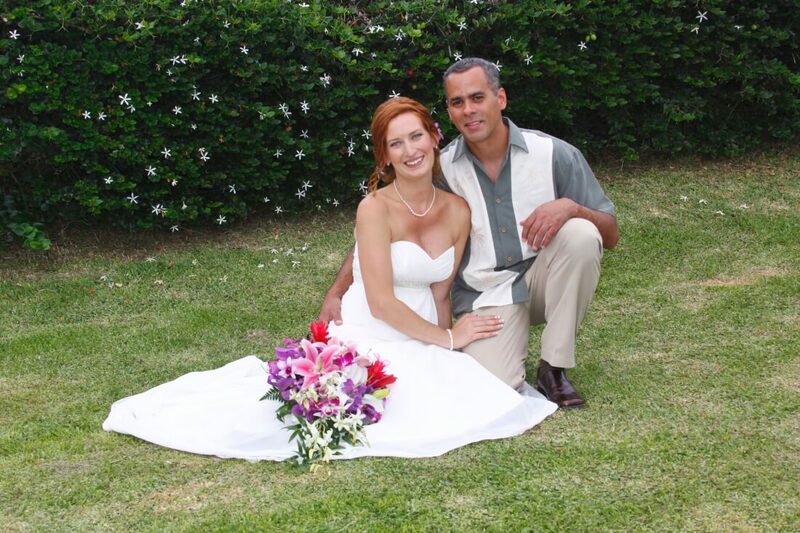 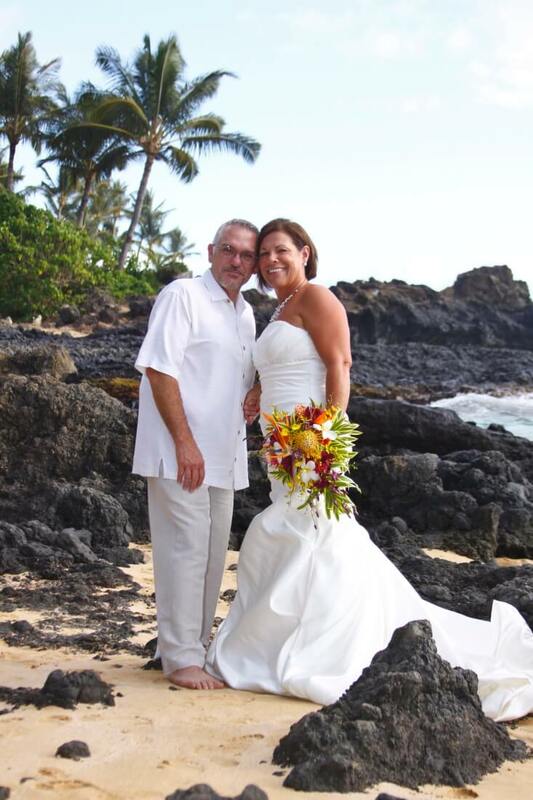 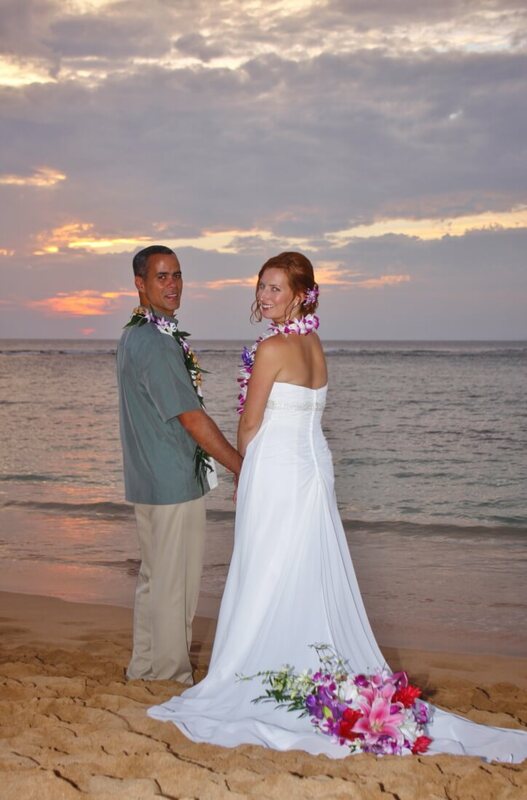 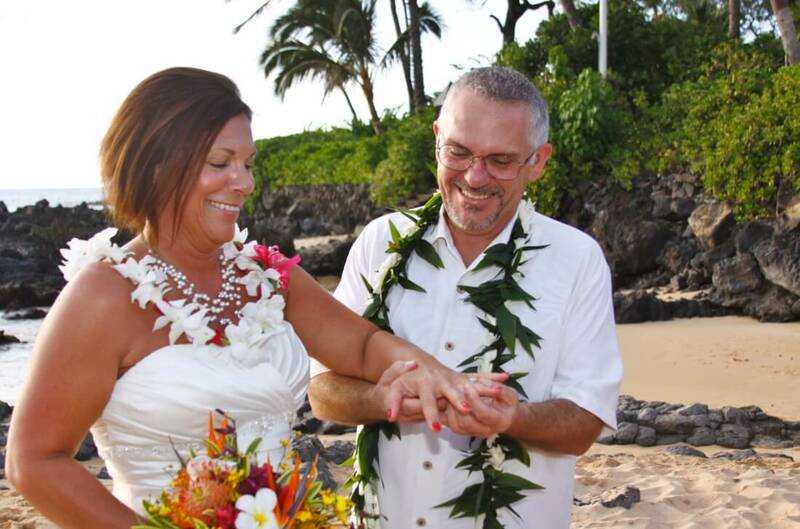 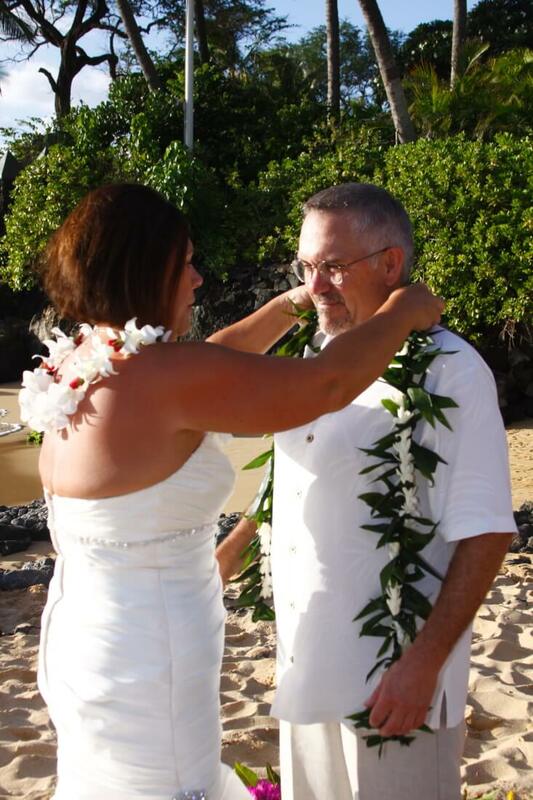 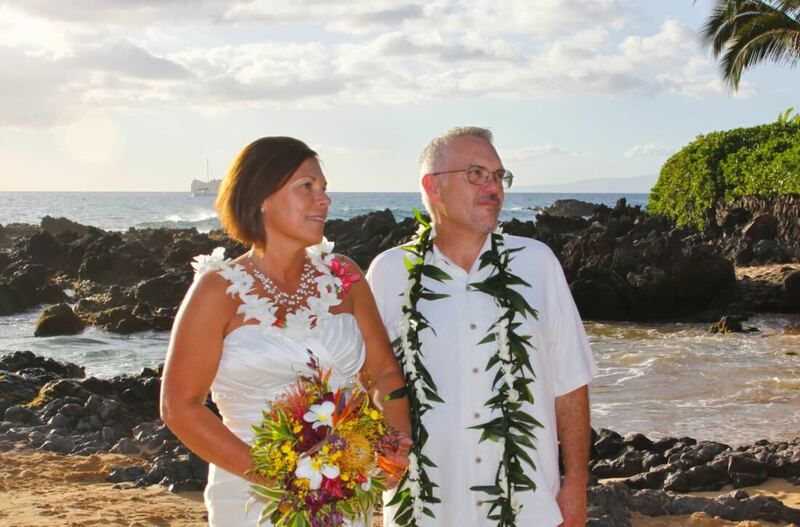 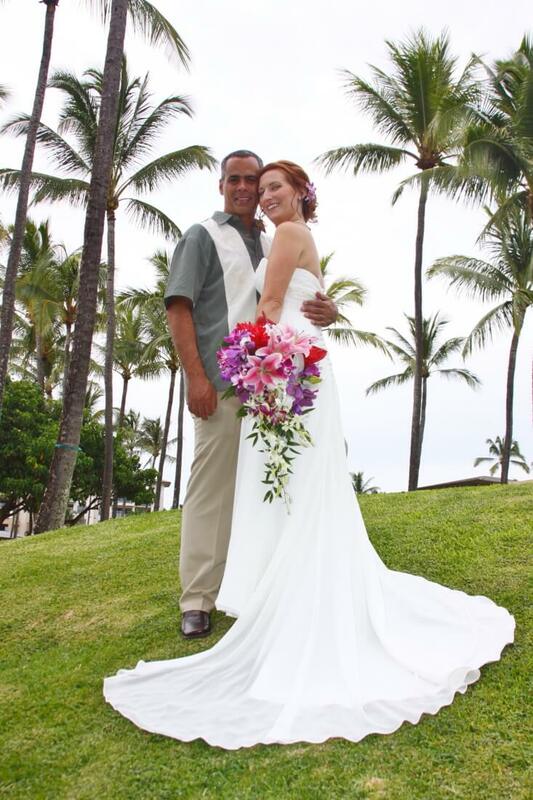 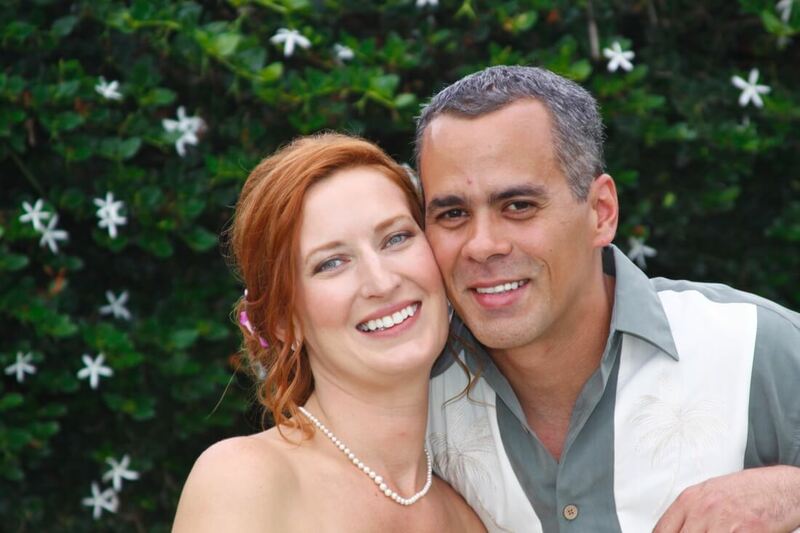 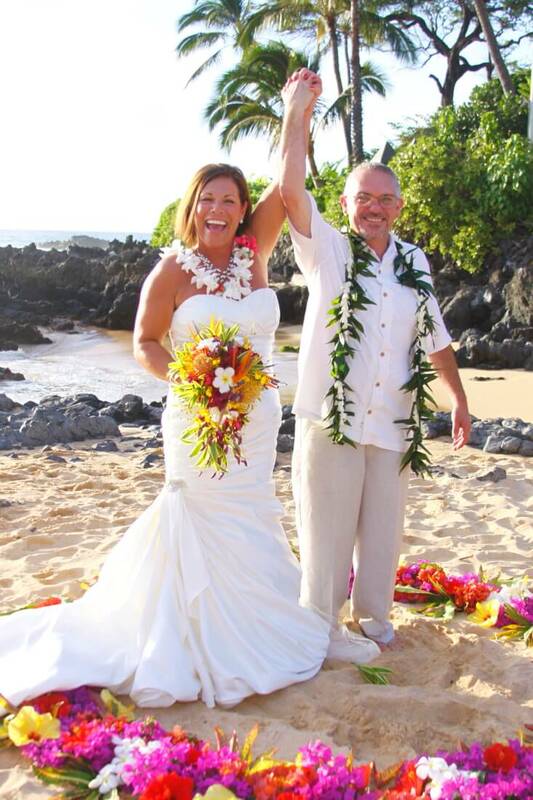 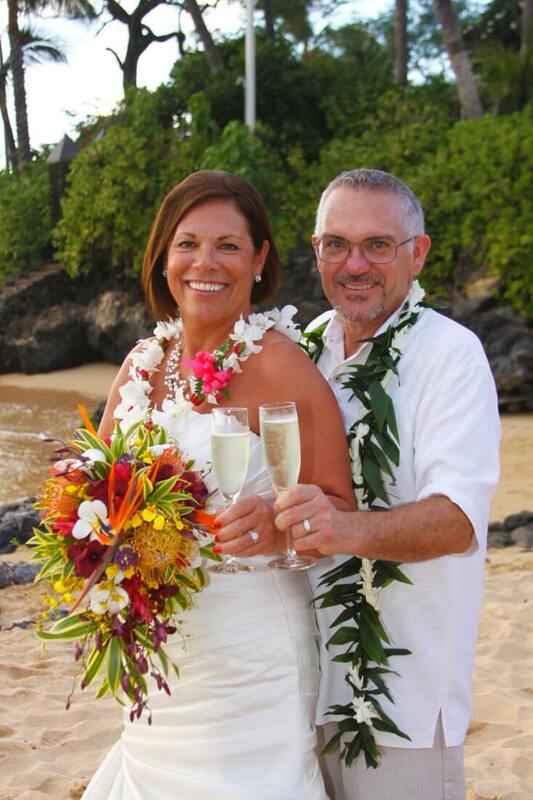 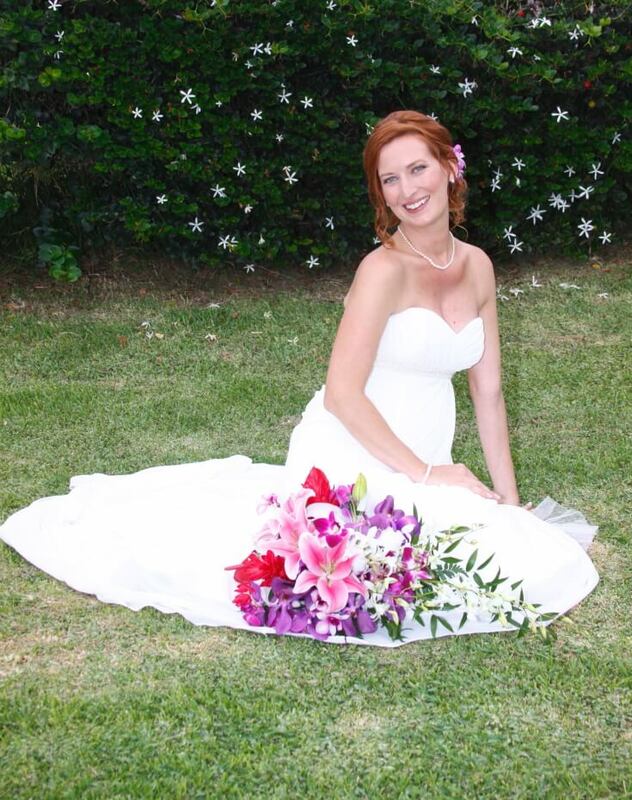 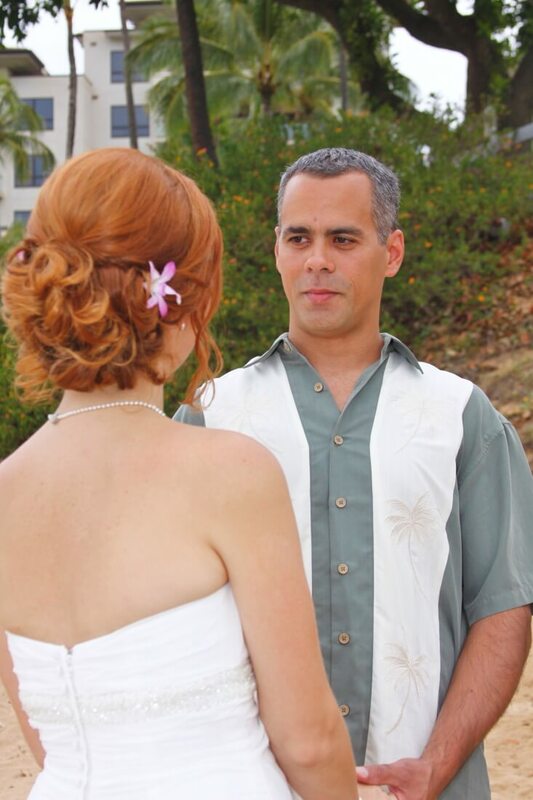 This couple chose the “Daytime Delight” Maui wedding package. 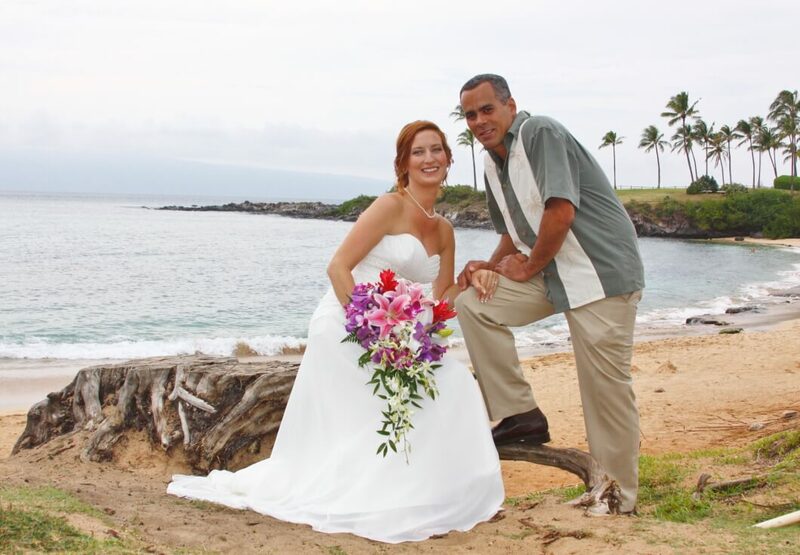 This package allows Maui wedding planners to give the couple a wedding they wanted and could still share with their families; a private romantic wedding ceremony without having guests, but still having a video they could share at the family reception. 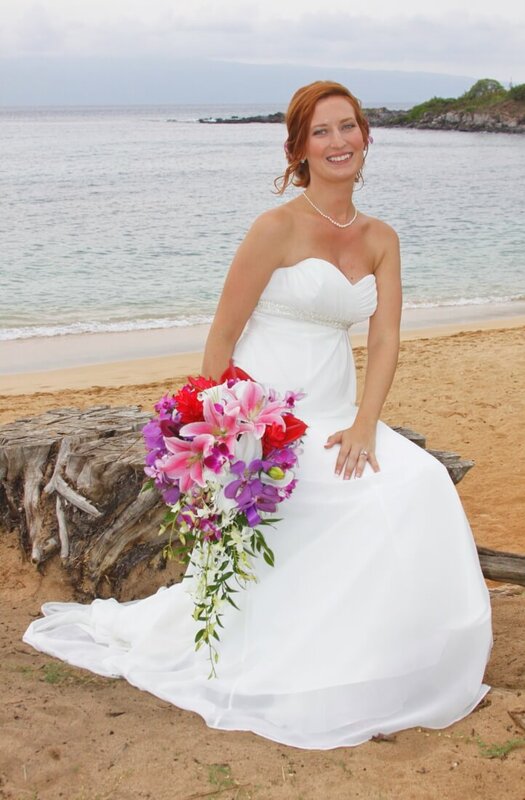 A harpist was included to add to the romantic peaceful feeling already in play with the choice of Kapalua bay as their wedding location. 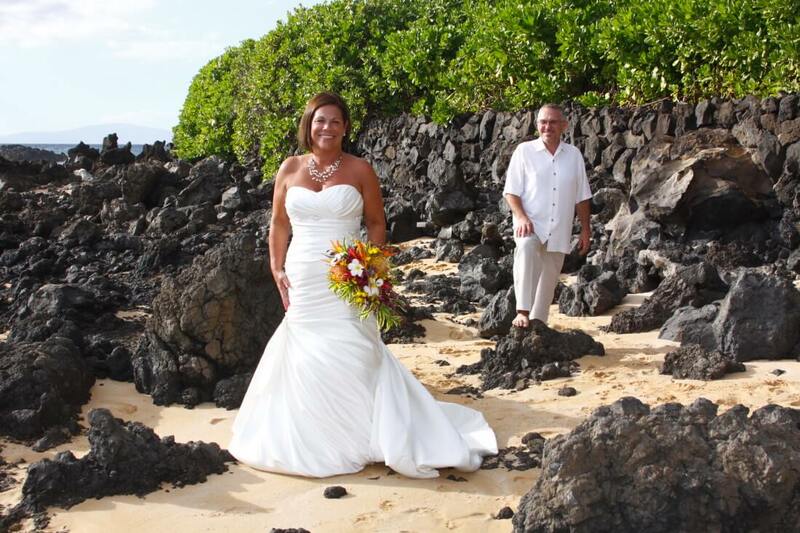 Beautiful flowers, a lovely wedding gown, a happy couple, a beautiful blue sky,and a deserted morning beach all added to this special day. 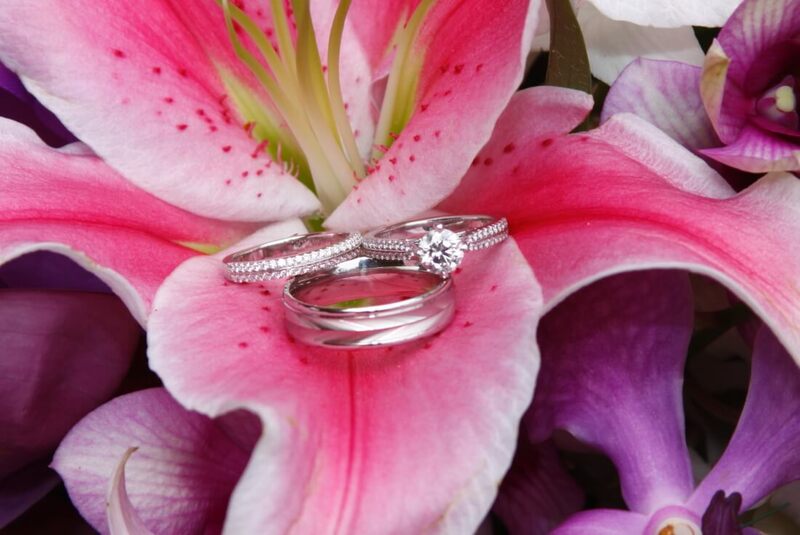 I really enjoy the morning lighting for wedding ceremonies. 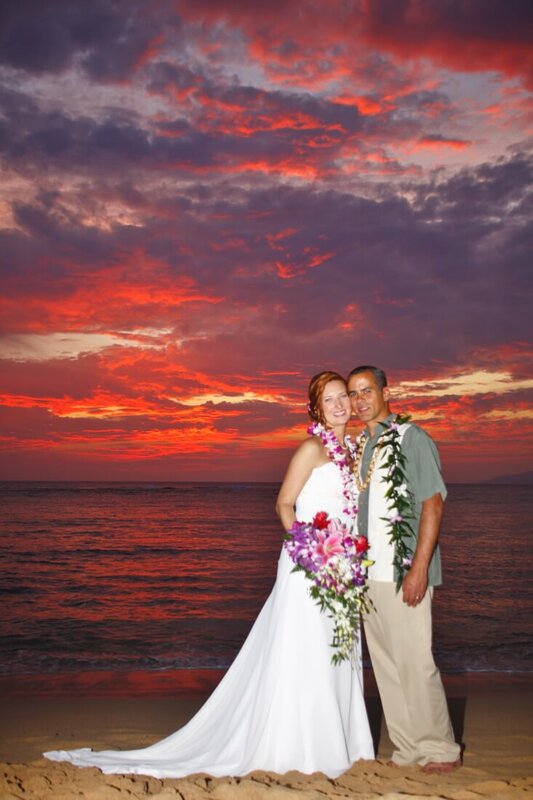 The photography is always so elegant and sparking with rich colors of a blue ocean and a clear morning sky. 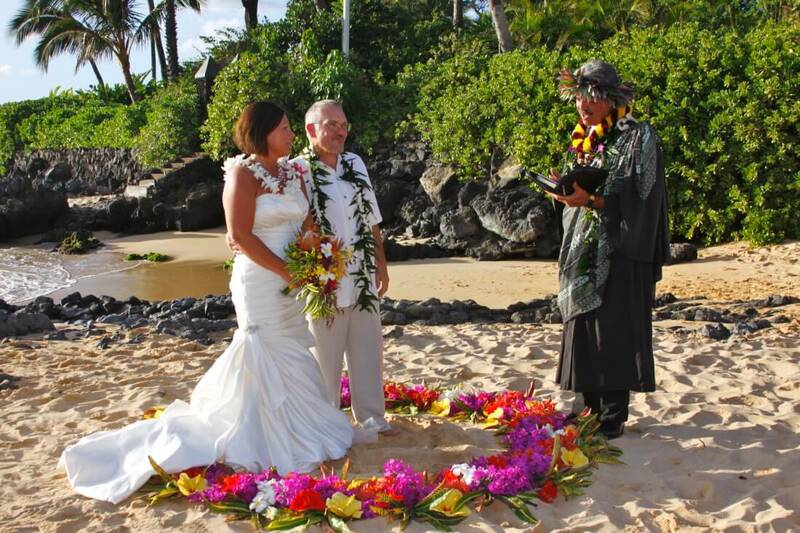 The couple now has the whole day to celebrate and enjoy each others company as a newly married couple. 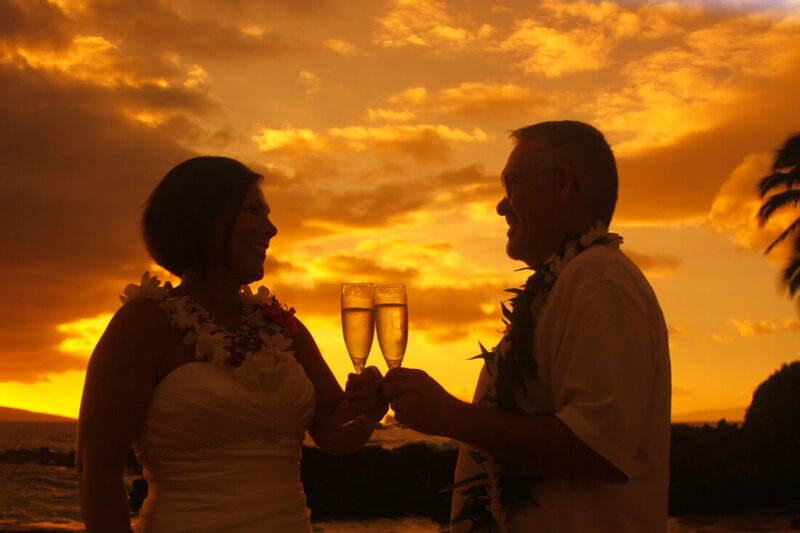 You can celebrate the evening with a Hawaiian luau feast, a dinner cruise or just a romantic dinner at one of our incredible restaurants. 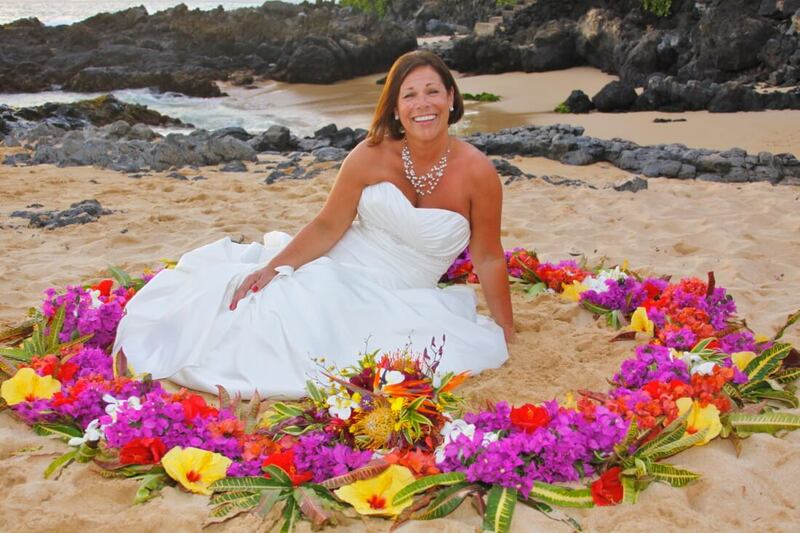 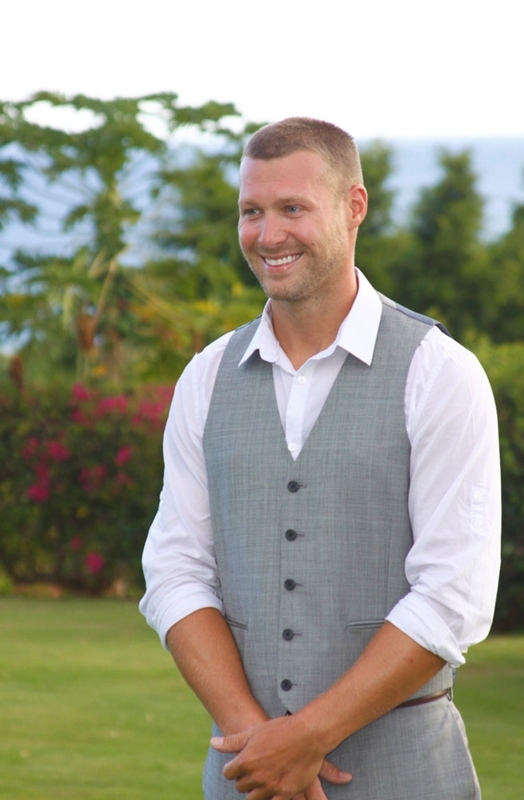 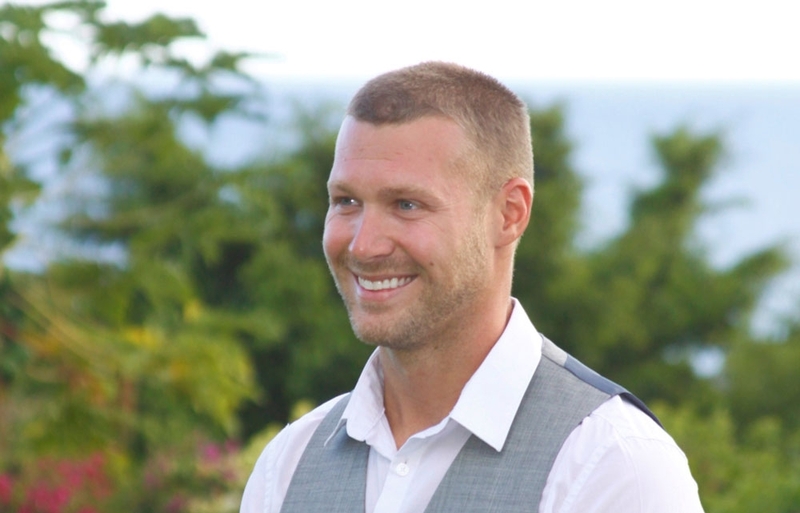 This was a summer wedding in Maui and a Maui wedding planners dream. 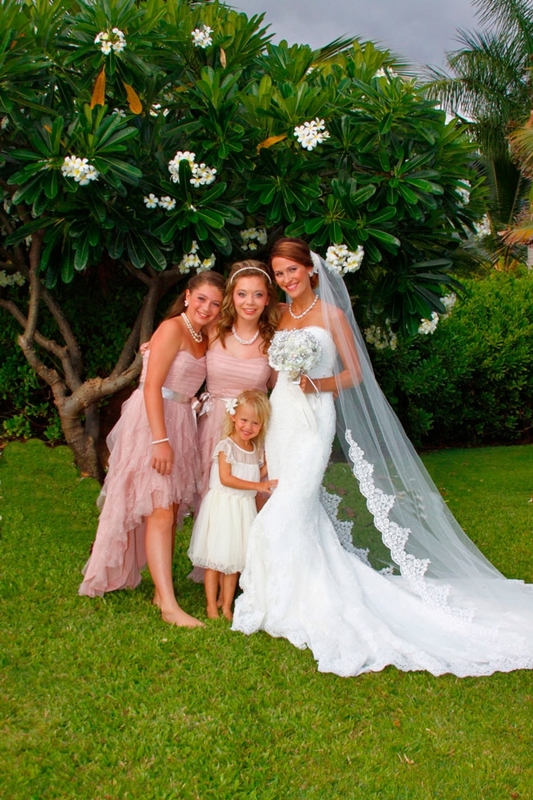 The family wanted to have everything wonderful for their children’s wedding day. 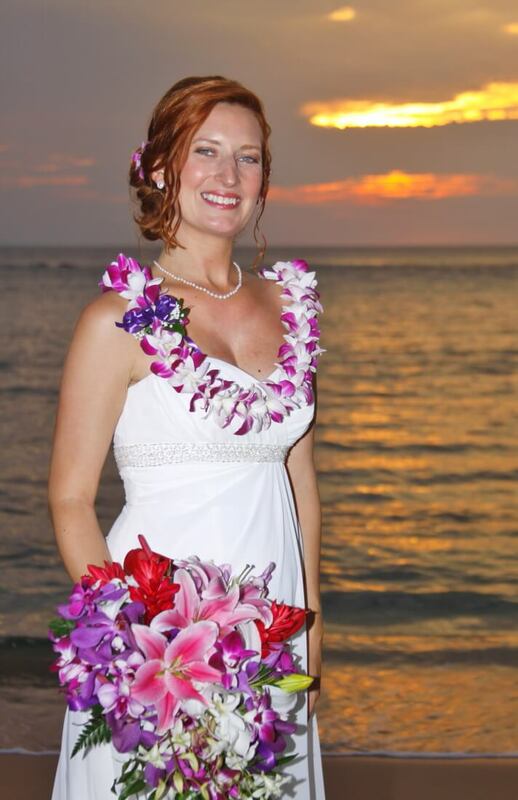 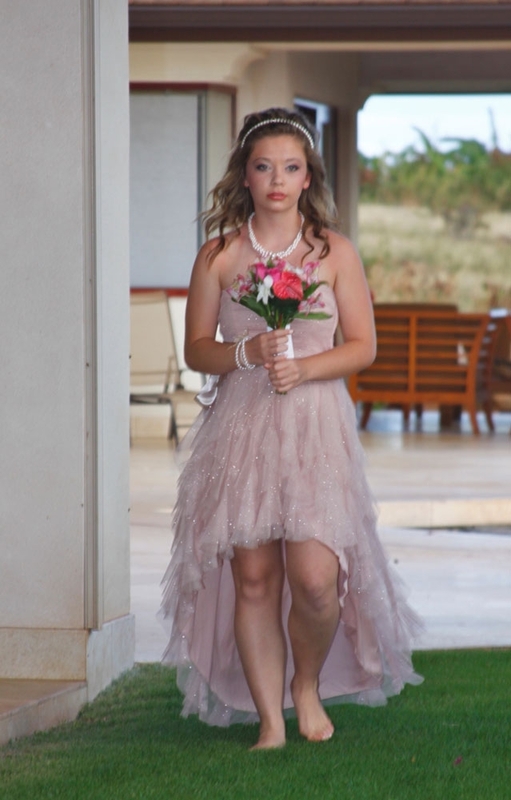 They worked with the Maui wedding planners hair & makeup artist to come early to get the bride ready with the look of a princess. 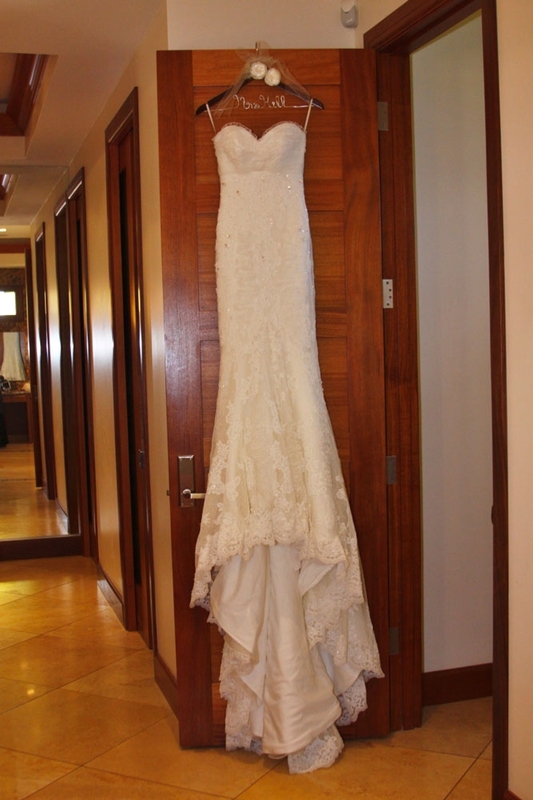 Also having the photographer there early to capture photos of the bride getting ready and those very cool mirror image shots adds to a full event of the days celebration. 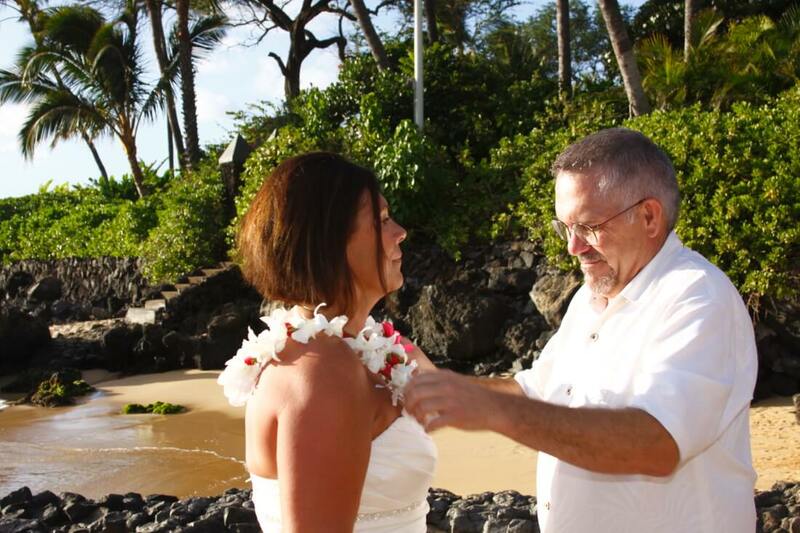 And lets not forget the Maui groom relaxing by the pool while awaiting his bride to be ready for their ceremony. 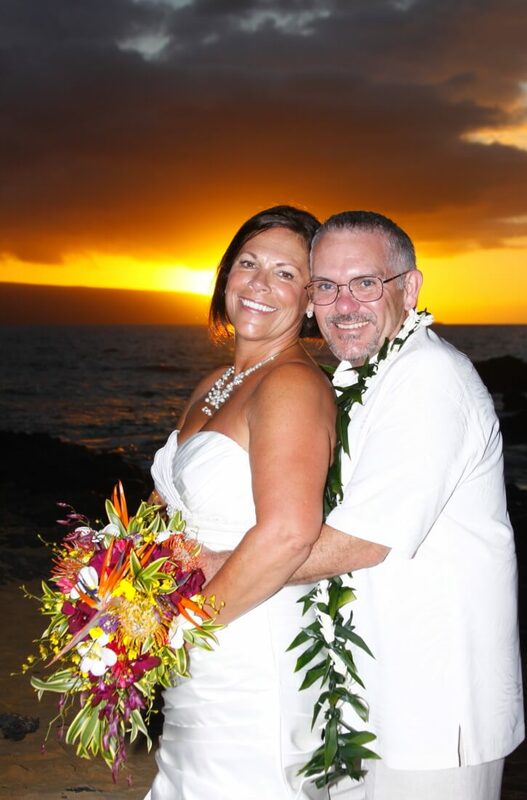 After the ceremony, your Maui wedding planners photographer gets some images along with some video segments including the celebration toast and cutting of the cake, and then of course ending it all with those Hawaiian sunset colors to make the whole event the best Maui wedding day they could have dreamed of. 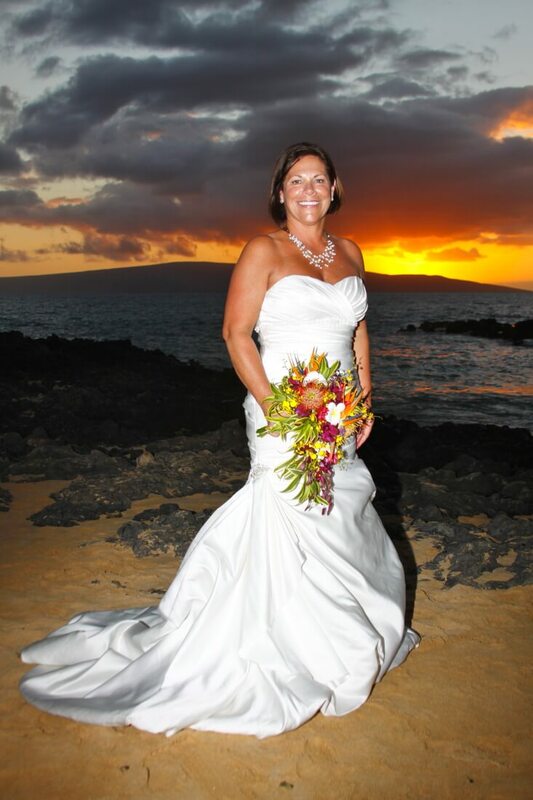 A sunset wedding to remember !!! 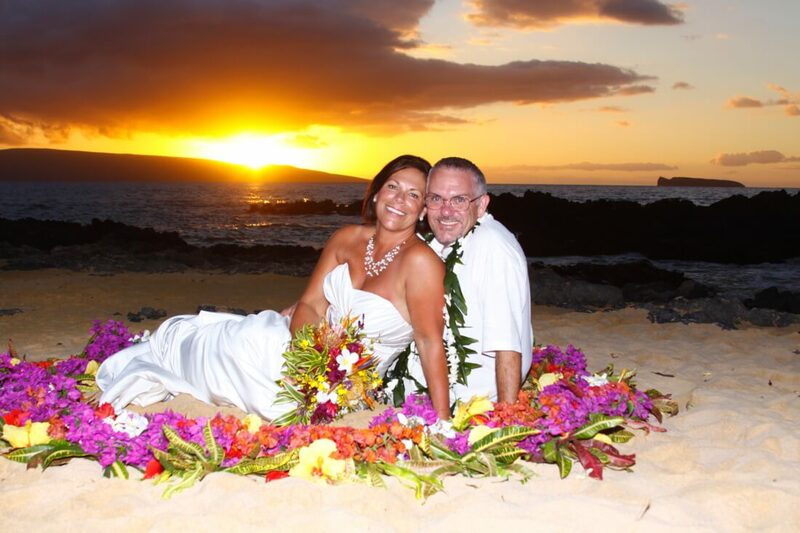 This couple chose a very nice package, Romantic Maui Sunset, which happened to be one of their Maui wedding planners favorite weddings. 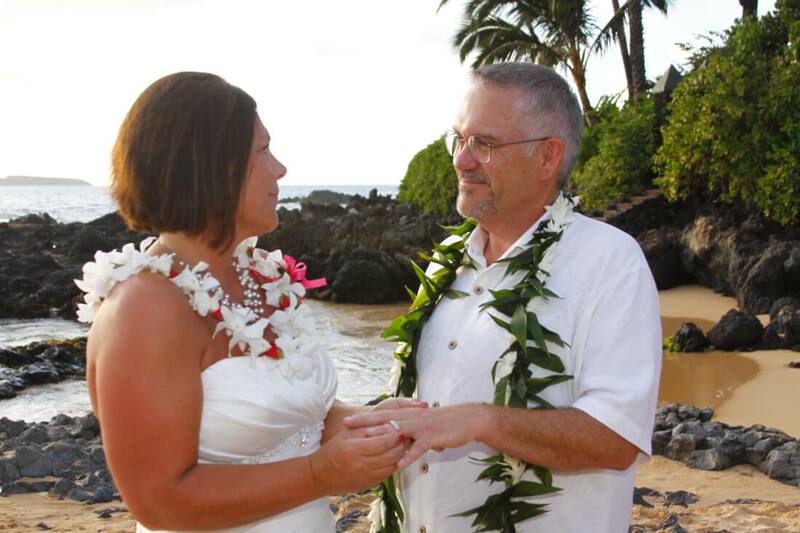 Even though they were alone it was something they wanted for themselves, a way to express the Love and romance of what marriage meant to them. 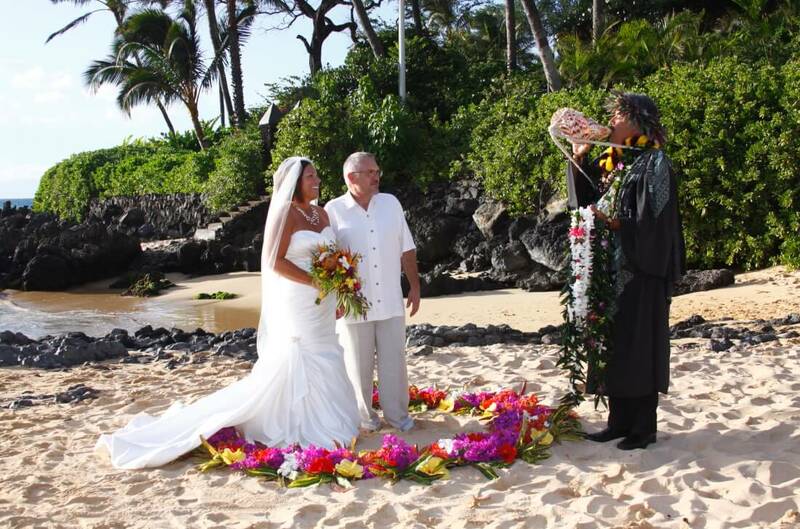 A very nice selection of details helped to make the ceremony memorable and beautiful. 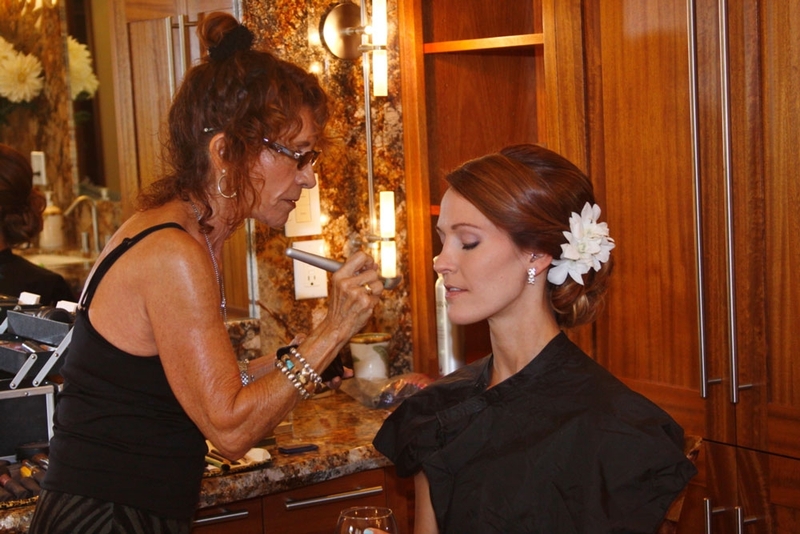 Starting with a hair & makeup artist who went to the room so the bride could stay in and enjoy the ocean front view and sounds of the waves crashing on the shore. 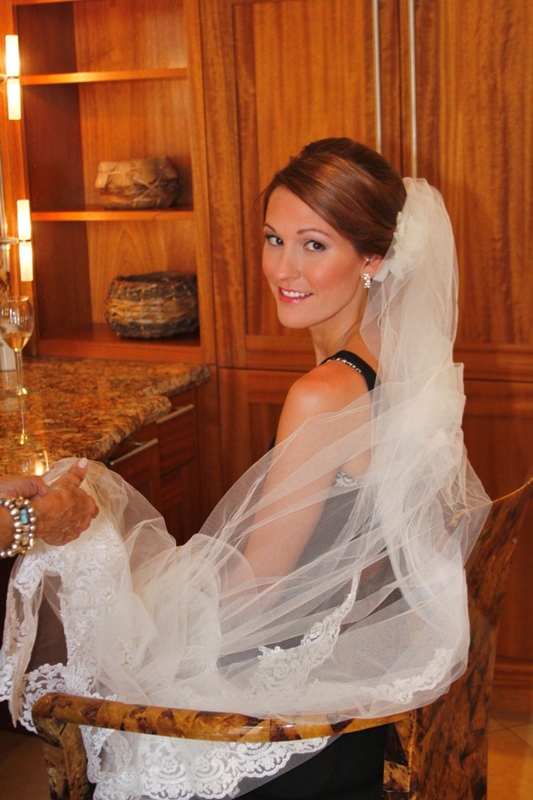 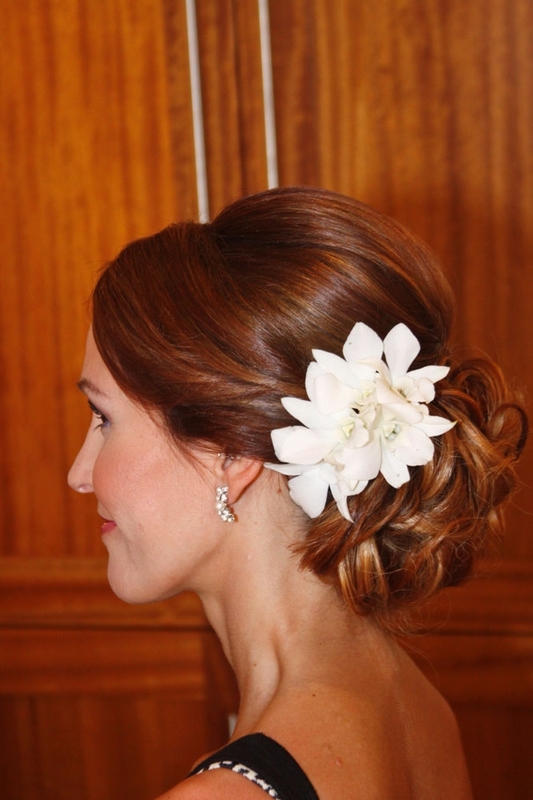 It is a relaxing way to get ready for your ceremony with out any stress or rushing. 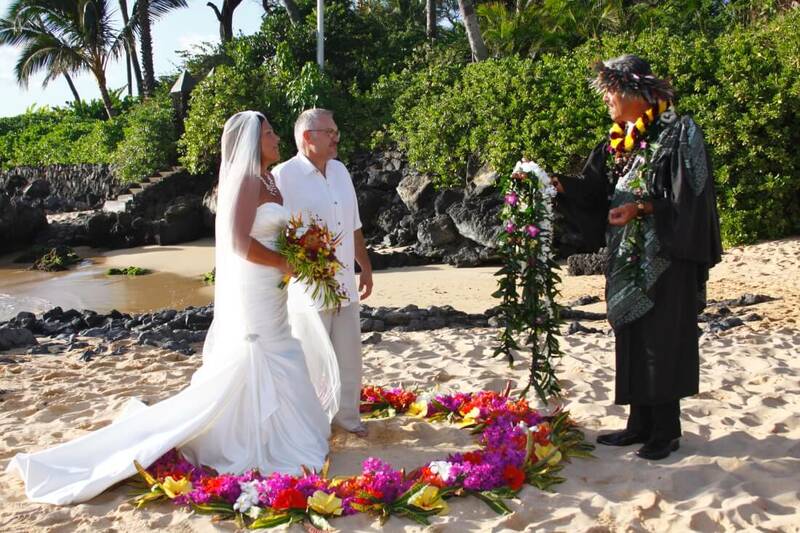 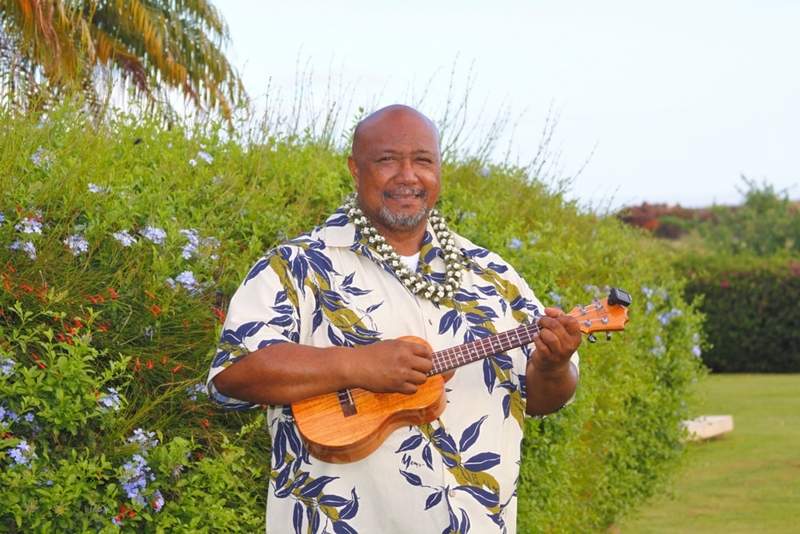 Incredible flowers & leis for the ceremony along with a musician to set the mood. 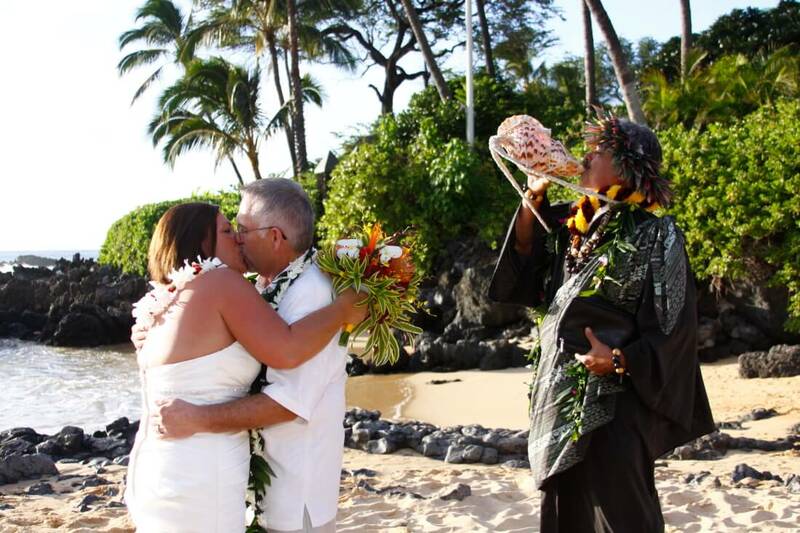 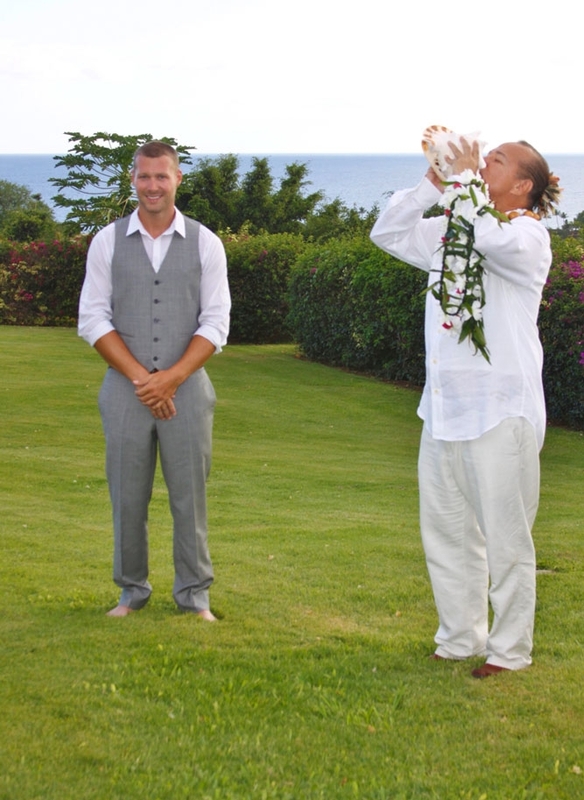 A Hawaiian style ceremony with a Hawaiian minister blowing the conch shell and sounding the Hawaiian wedding chant calling the island energies to be present at the location. 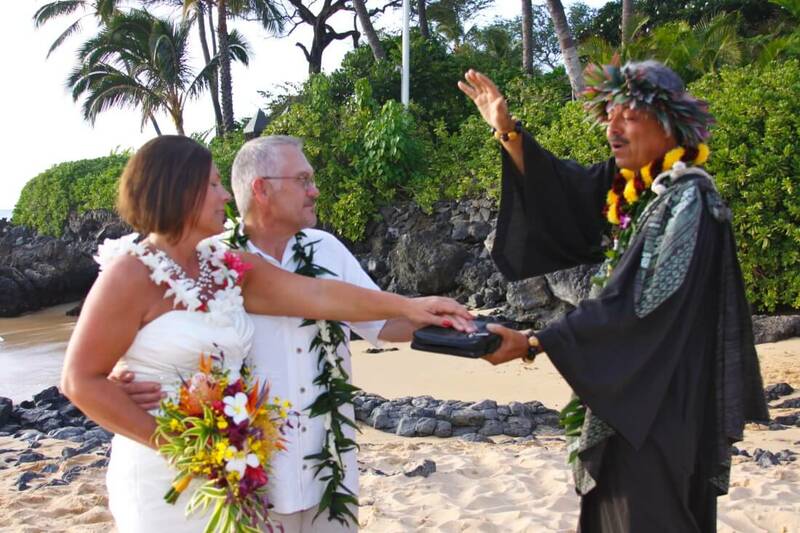 It was a very heartfelt ceremony and we all were feeling the joy. 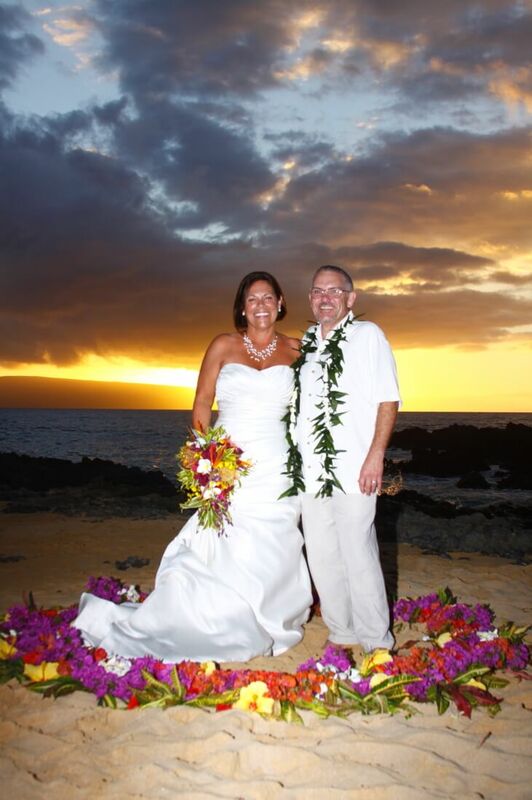 And the location, Kapalua bay at sunset, is like no other wedding location on Maui. 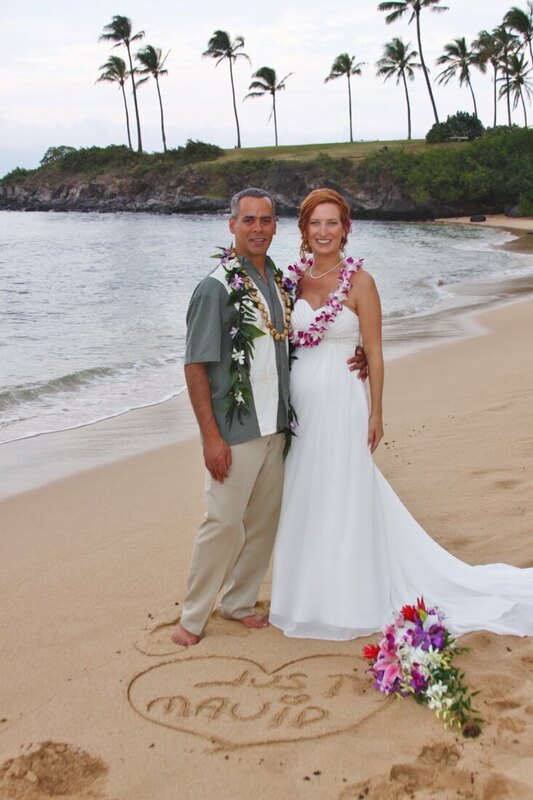 A location Maui wedding planners and couples alike both dream of! 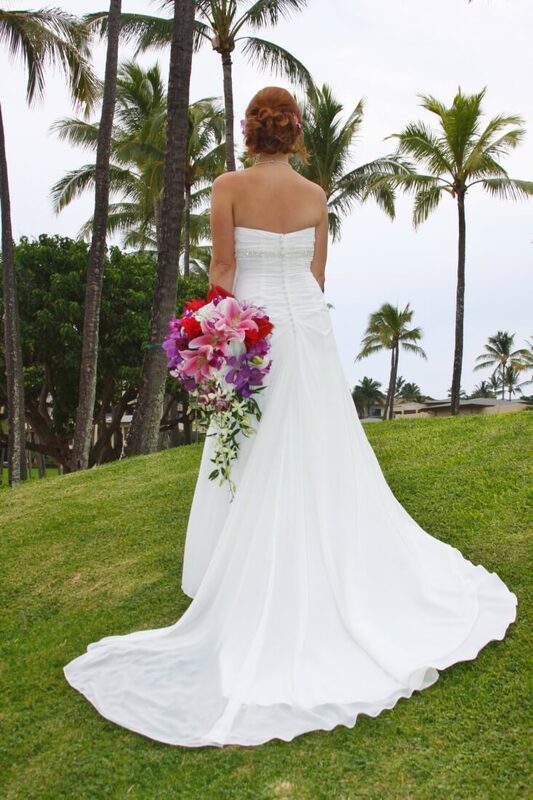 The palm trees, the grass lawn, the golden sand, the bright blue ocean and the incredible variety of photography that this location has to offer. 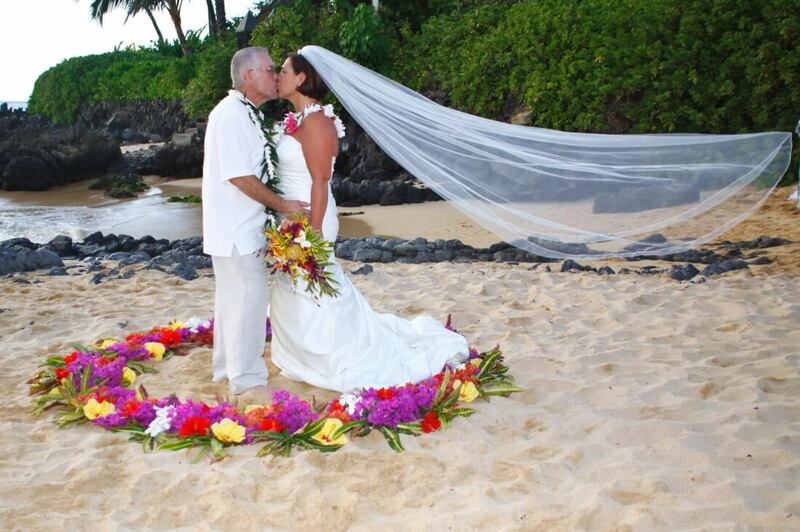 It really feels like a Maui beach wedding. 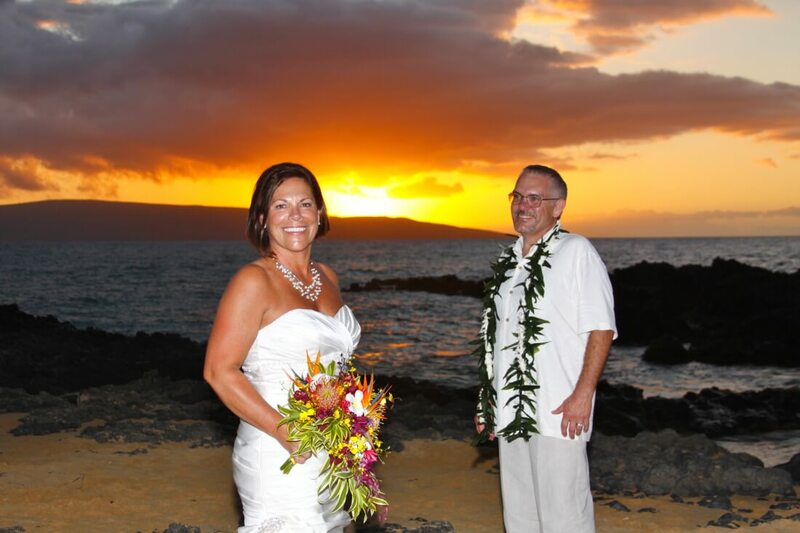 And then the sunset happened!!! 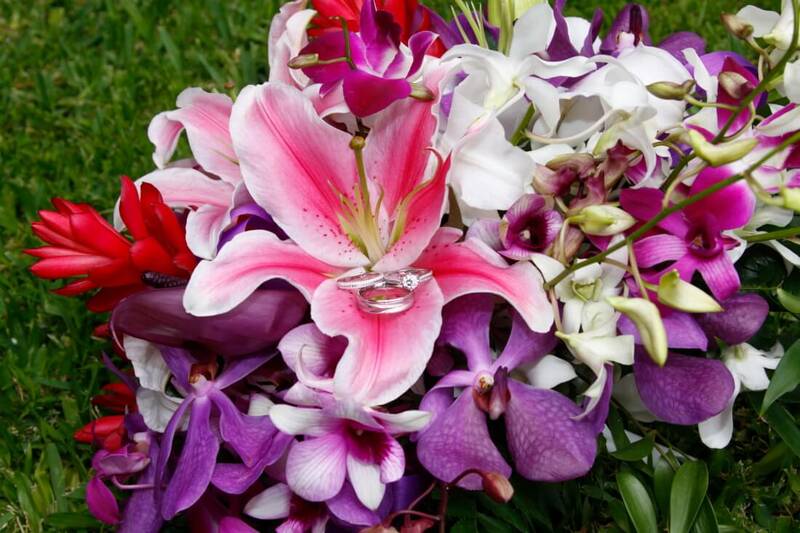 Spectacular!!! 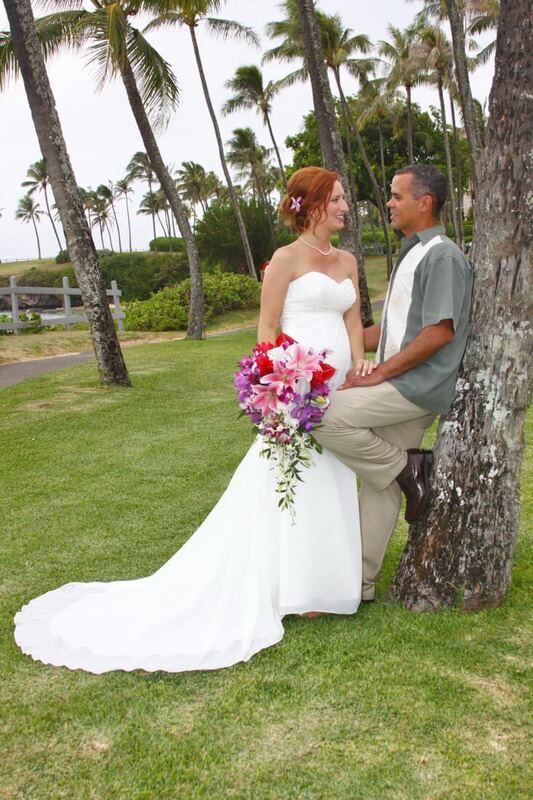 It was one of the best color shows for a wedding I have ever had the pleasure to photograph, and the reason Maui wedding planners love their job. 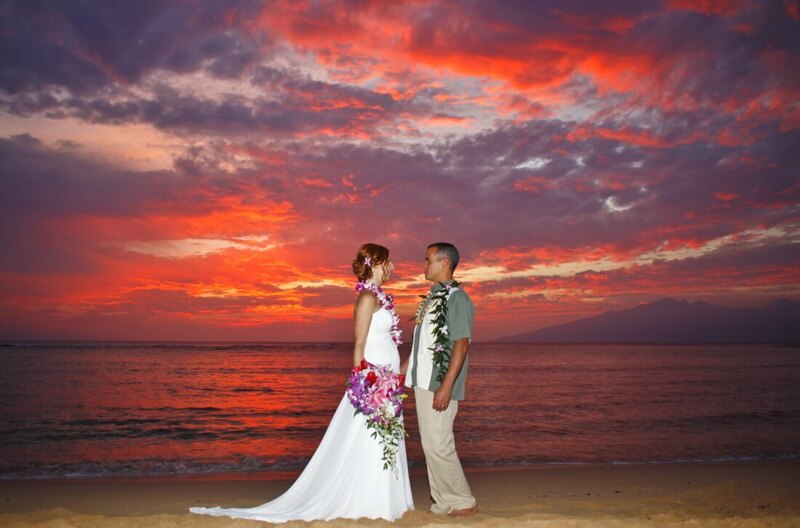 I always appreciate the colors for a sunset wedding, it is after all what they came for. 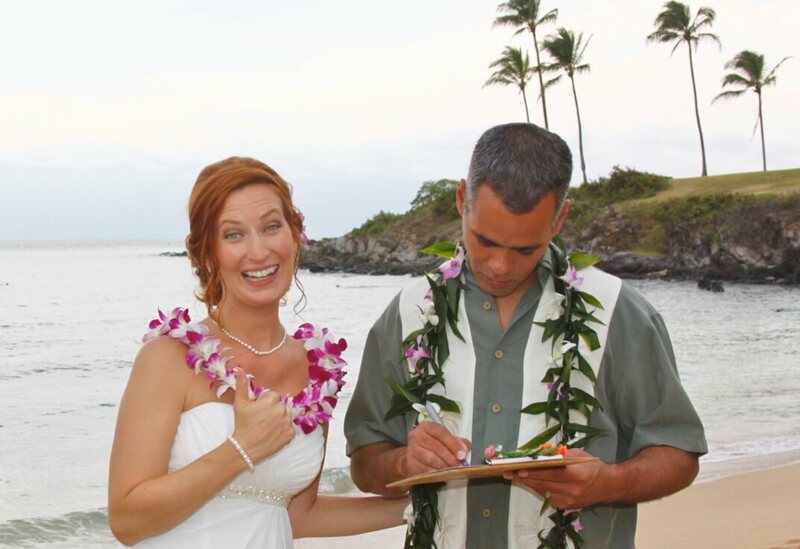 Makena cove, a popular maui wedding destination, is also a Maui wedding planners top location. 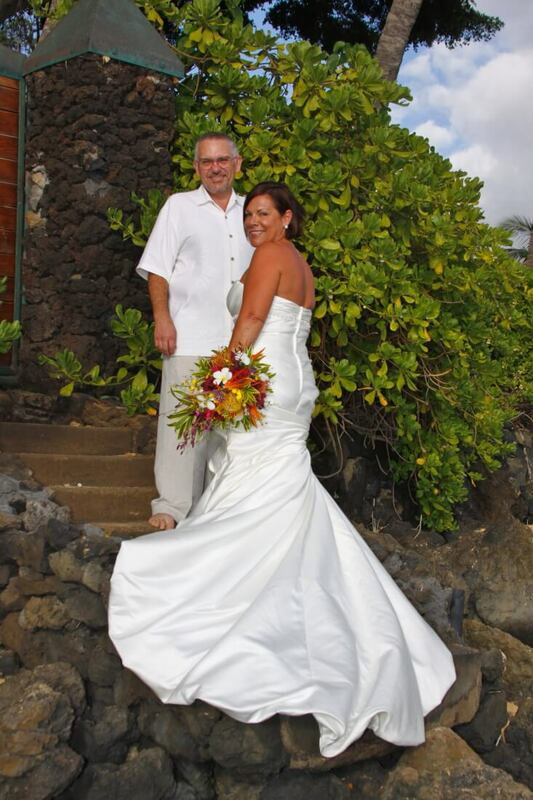 As soon as you step through the opening in the rock wall you can see why it is a favorite. 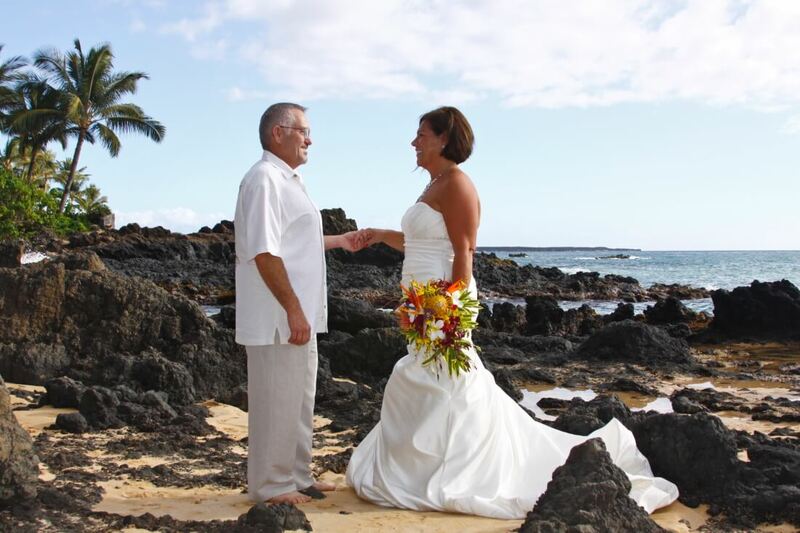 Lots of black lava rock and little inlets of water coming onto the small cove leaving you feeling like you found a small piece of paradise. 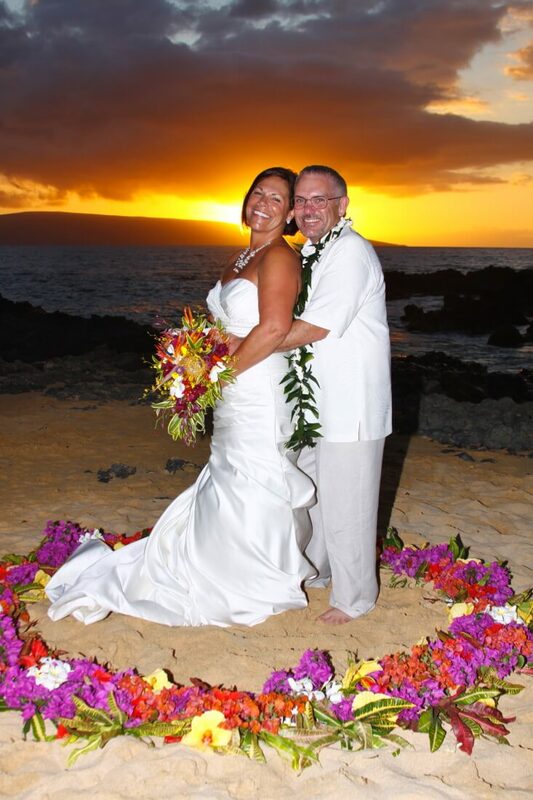 This wedding couple chose a sunset wedding with a beautiful addition of a flower circle to stand in for the ceremony. 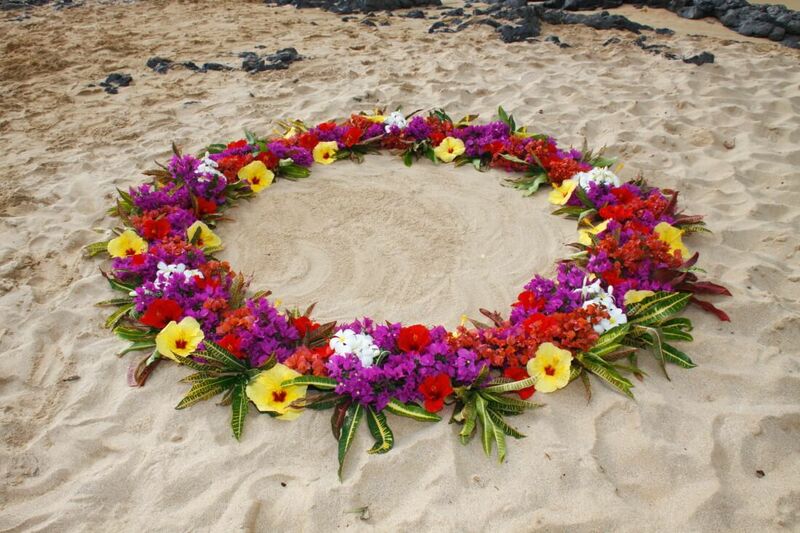 The flower circle helps to draw attention to the couple and add some color to the photos while they are surrounded by black lava rock. 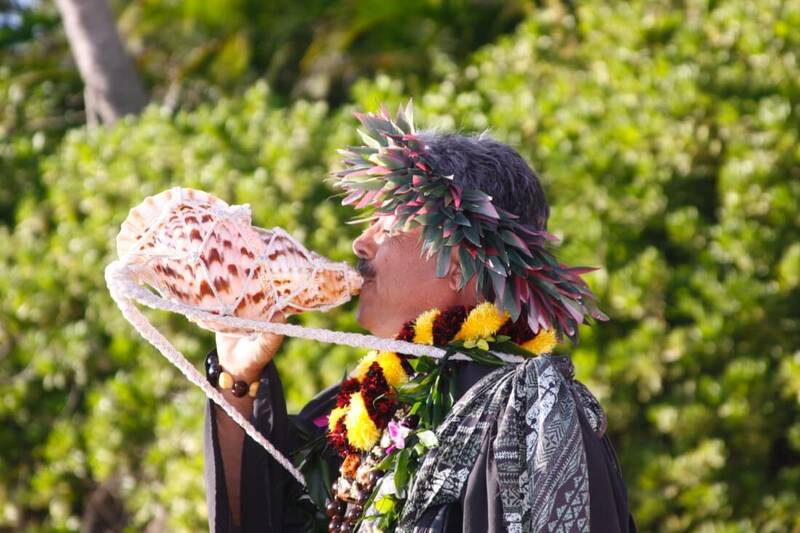 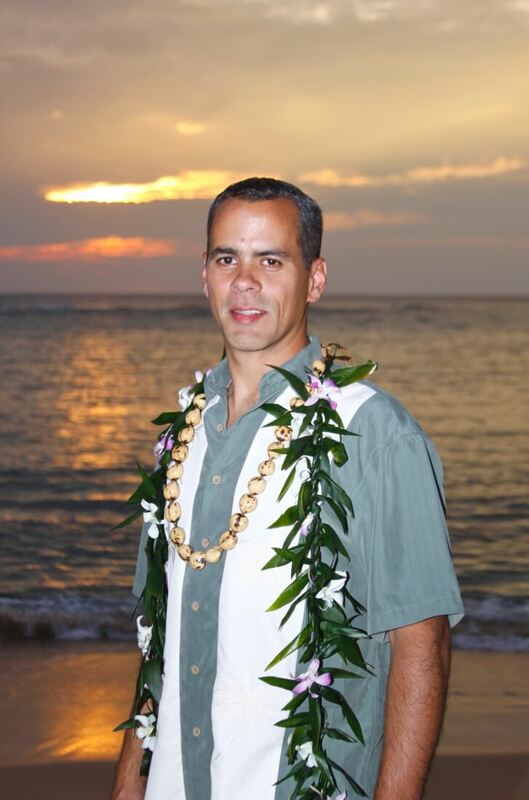 They also received the Hawaiian style ceremony from the minister, conch shell, lei exchange, and Hawaiian chants. 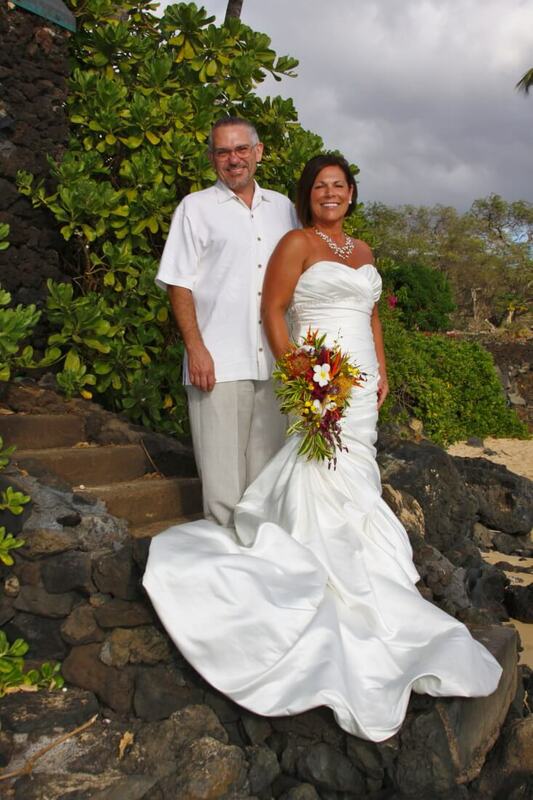 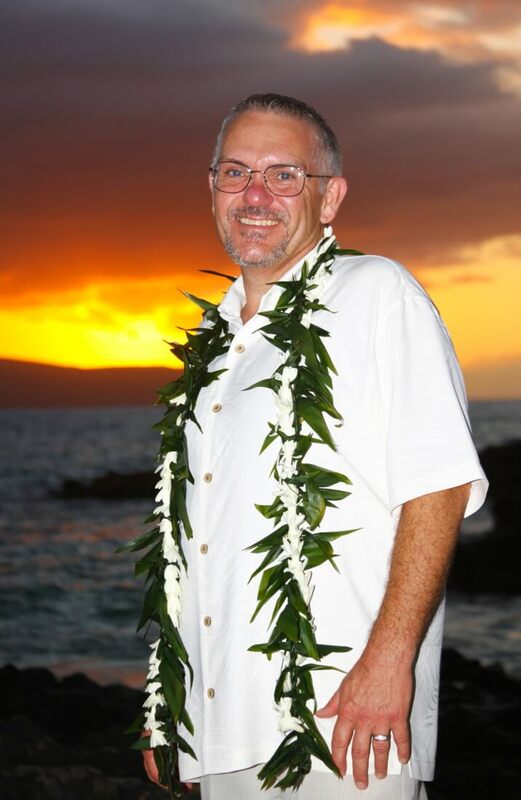 The thing about getting married on Maui is that the weather is always nice, which makes it possible for an ideal year round destination and keeps your Maui wedding planners happy as well. 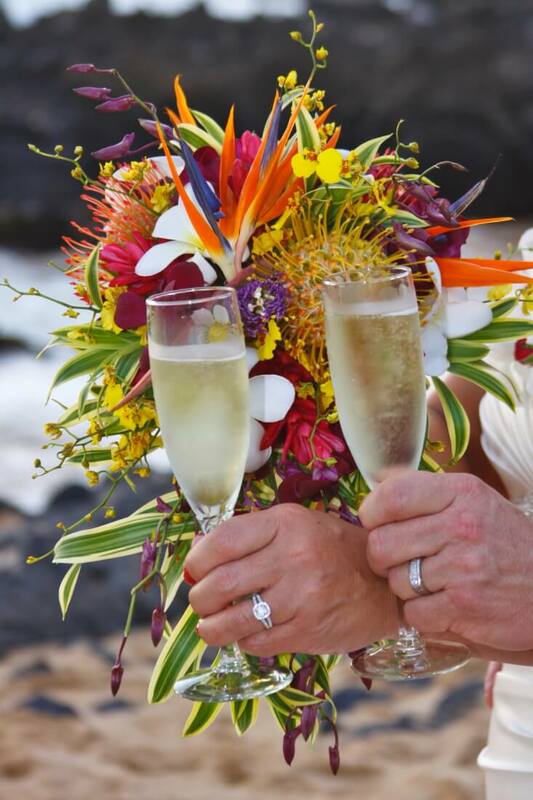 Maui weddings are the most popular weddings in the world. 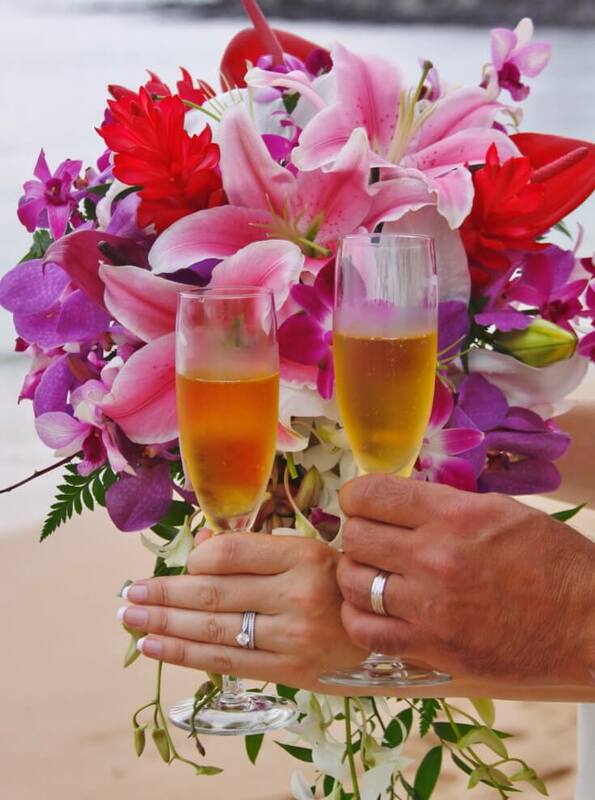 Thousands of couples come every year to say their wedding vows in the sand and then enjoy a very exciting adventurous honey moon. 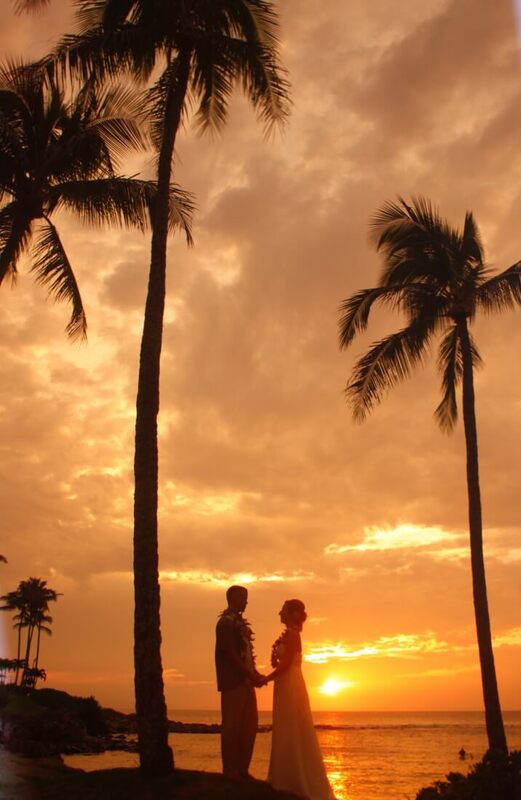 The Hawaiian island has so much to offer, giving you the feeling that you never want to leave. 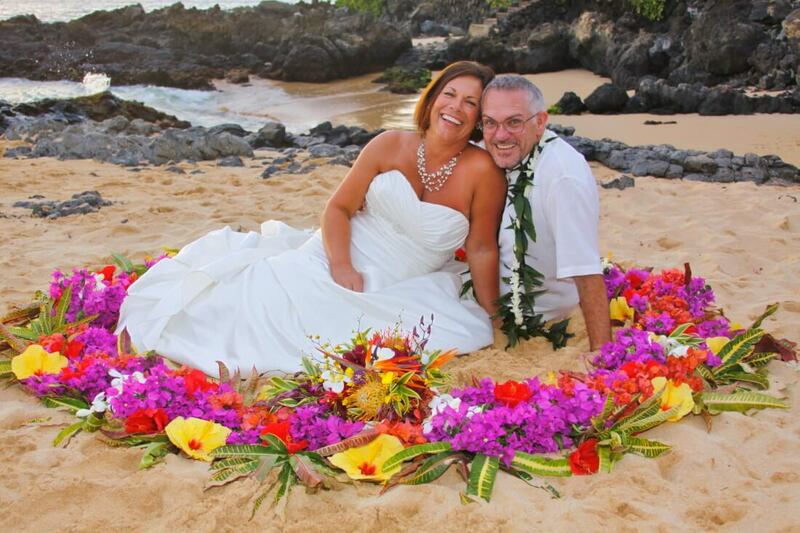 Come find out why Maui is a favorite destination for Maui wedding planners and the couples that choose to get married here.